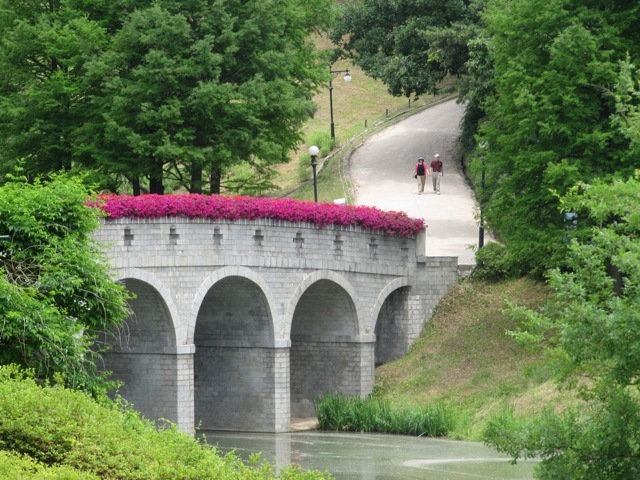 People often ask me how I find all the places I find here in Seoul. I’ll tell ya, it’s not easy. It takes hours and hours and hours, sometimes days, of research, and then days of building up the courage to just set out in search for a place and be prepared to get lost. I have no Korean translator handy to fill me in on the details. 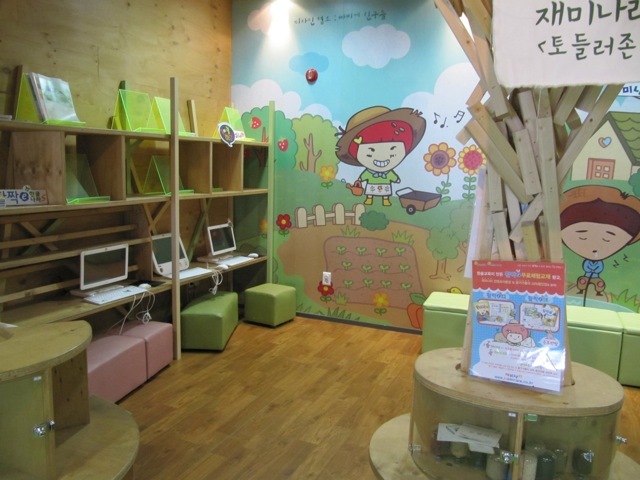 Since I can read Hangeul, I usually can click around on a Korean website until I find a link to a map. Then I sit with my MANY maps of Seoul and surrounding areas and try to make out the name of a subway station near my destination. Once I find something I can identify as a station, by the word “yuk” after a name, I get out my subway map and find the area of the station, the line and the distance from my house. After this point, you’d think it would be simple enough to just get on the train and head out there, but, for me, that feels risky. Since I don’t know the area I’m going to, don’t know how long it will take me and will have three kids in tow, the train is no friend to me. Instead, I pile everyone in my car, type the name of the nearest station into my Navi (GPS) and drive out there on my own. I usually make a day of it and give the kids strict instructions about noise level in the car while I’m driving. It’s nerve-wracking, I won’t lie. However, I feel a little bit in control when I can drive myself. 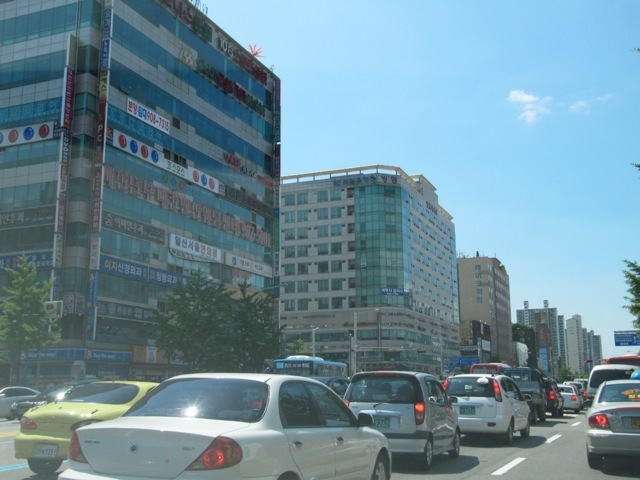 The vast majority of my friends here in Seoul don’t drive. It can be scary to drive here, and with the rude honking of horns, no one tolerates mistakes, but after all is said and done, it IS just driving and I’ve been doing that since I was 16. 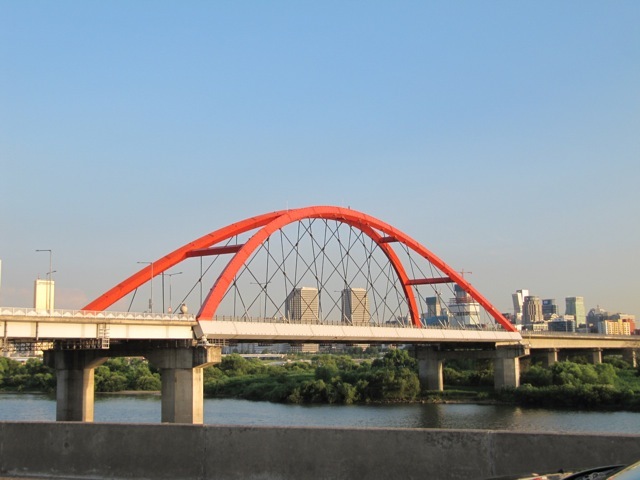 I drove in Tokyo and small suburbs of Japan on the opposite side of the road. 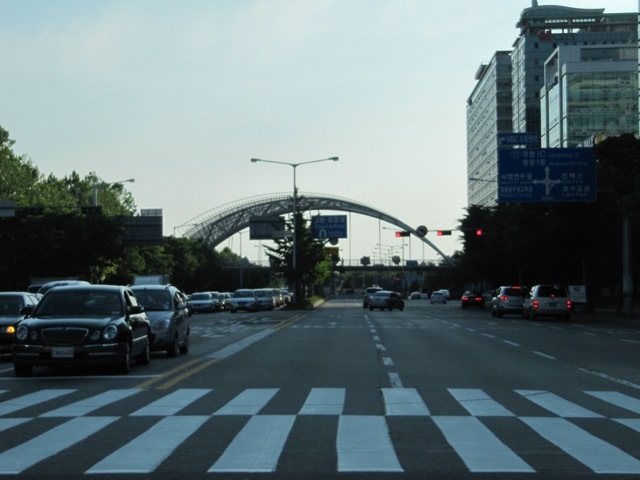 Here in Seoul, I drive my right-hand driver mini-van on the left-hand driver roadways. If I can manage that, I hope others will feel brave enough to drive their cars around too. 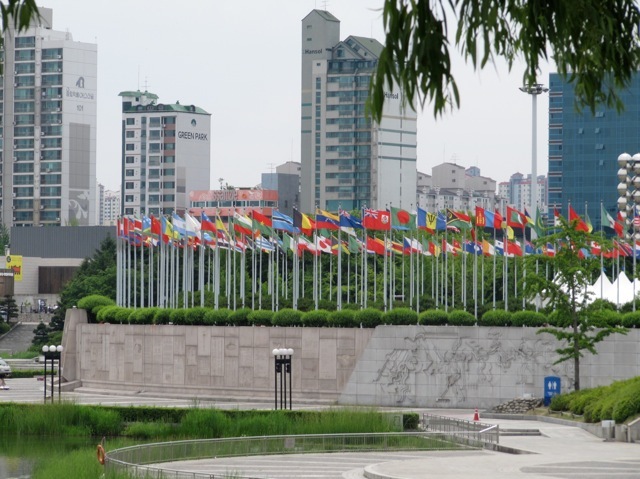 Exploring the city you live in can be empowering and insightful, especially if you live in an amazing city like Seoul where you could spend an entire lifetime and still not see everything wonderful to do here. Every time I venture out I learn amazing things that change my life, alter my perceptions or broaden my horizons. Go ahead and explore. Get out there and just do it. Find what works for you and explore the city where you live. Then, post here and tell me about your trips. They don’t have to be in Seoul or even in Korea. I’d love to know about a cool place near your house so that I can plan a trip and we could meet for coffee. Technology has forever changed the way I fly internationally with children. Before the iPad, before the iPod Touch, before Nintendo DSi, entertainment options were different. Occupying children on a long plane ride meant over-stuffing my carry-on with things like play dough, magnetic toys, coloring books, stickers, crayons and myriad other diversions to keep idle hands busy. Now, I still bring a few of those items, but I noticed a shift in the way my kids, age 12, 8 and 3 pass the time on a flight. My bag is no longer filled with only miniature versions of toys, but electronics have taken their place. iPod and iPad movies and games keep my kids busy for long stretches. The Nintendo DSi does the same. 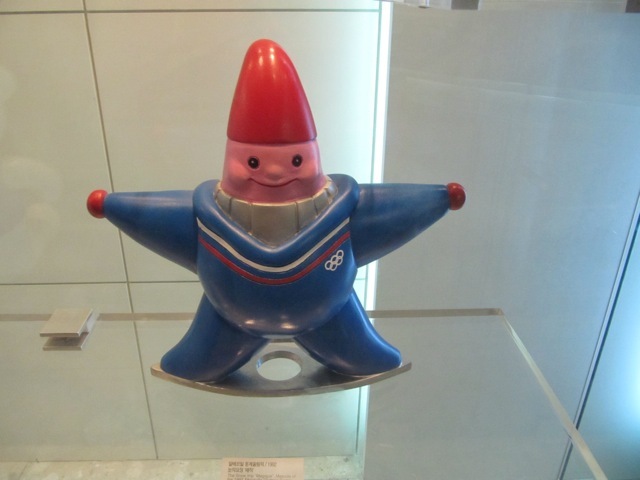 Other things that the kids did on the 11 hour flight: folded origami, played with mini toys and Polly Pockets and listened to inflight music on the kids’ channel. For my oldest, I was happy to see her reading a book she brought along. For my youngest, eating lollipops was another great diversion. Yes, portable technology has certainly changed the way we do lots of things, but trust me, flying internationally with kids is SO much better with these wonderful devices than it was without them. 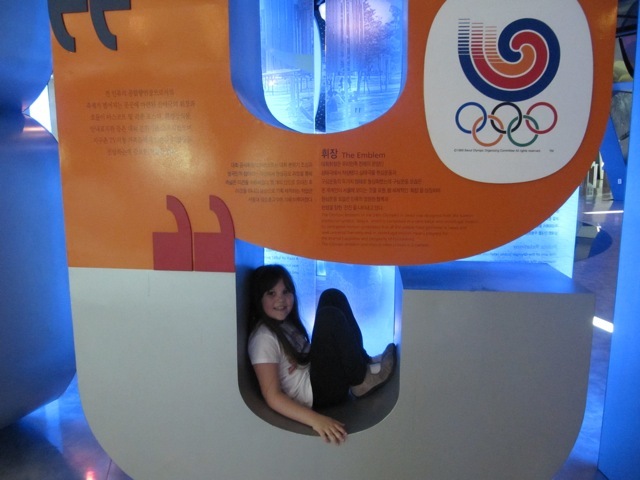 July 2, 2010 – It’s been two years that I’ve had the Olympic Museum on my list of places to visit. 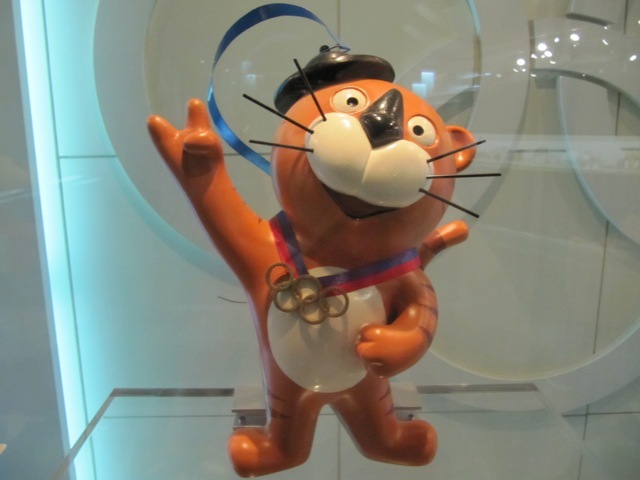 When I finally took a trip out to Olympic Park this month, I was blown away by all the fun things there were to do. The best part is that the museum was completely free. The only thing we paid to do was park. 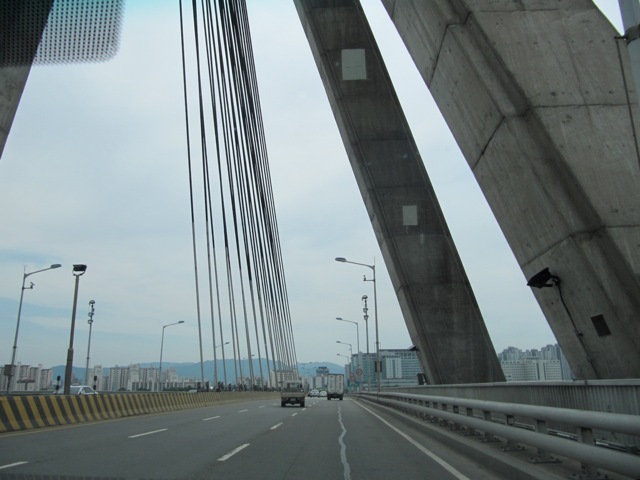 The first part of our journey was to drive across the Olympic Bridge on the way to the Park. 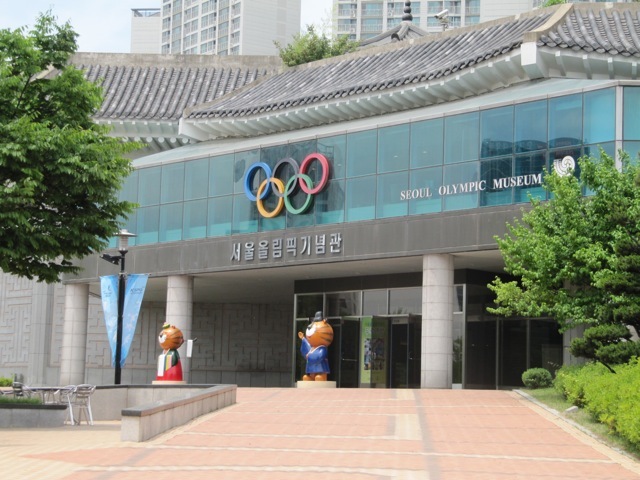 It’s silly, but I wanted to take this route and really experience the history of the 1988 Olympics in Seoul. 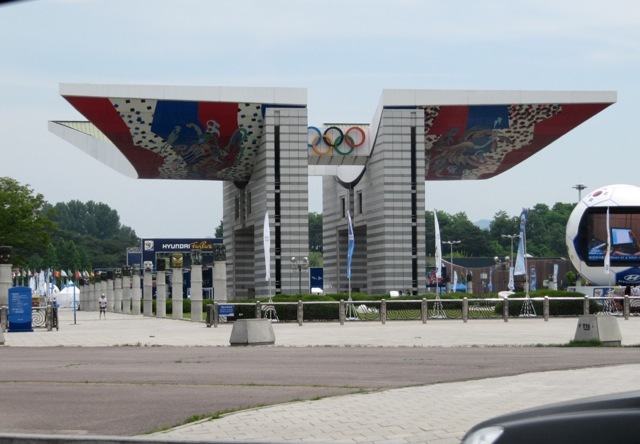 Many remnants of the games remain here in the city, and it’s wonderful to see the facilities continue to be used for so many events. On the top of the Olympic Bridge you can see the torch that was representative of the games. I think it probably was lit up during the event. I would love to have seen that. 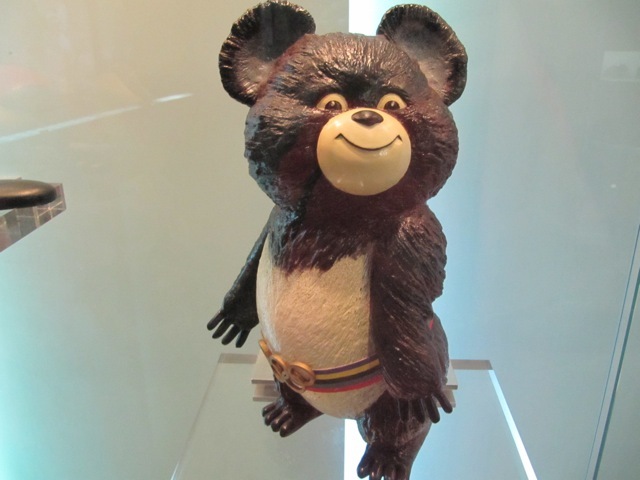 Once at the Park, our first stop was the Olympic Museum. 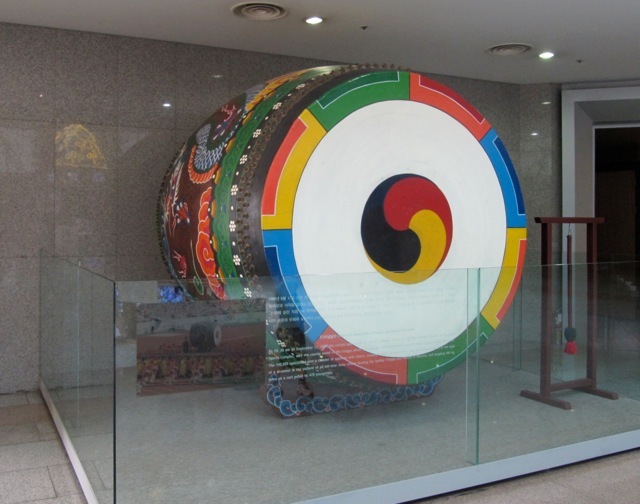 Admission was free and parking was a mere 4,000 W.
We also liked the Yonggo, the Korean barrel drum, that was used to signal the start of the games on September 17, 1988. 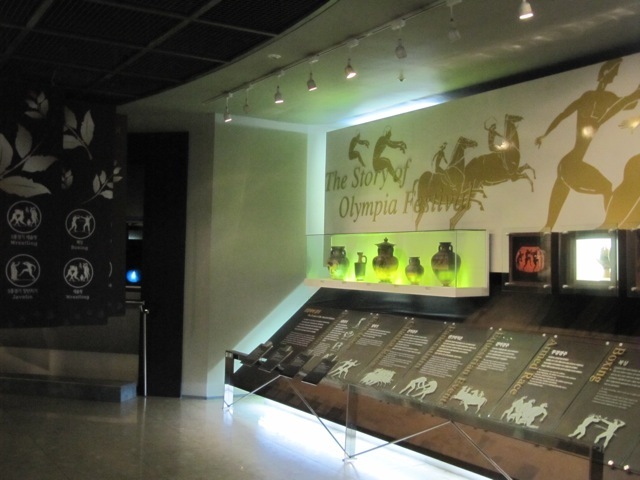 Inside the first hall, called The Place of Peace, we learned about the history of the Olympics from Ancient Greek times through modern times. We guessed at some of the sporting events being represented by the statues in the center of the room and kids tried to copy some of the poses. 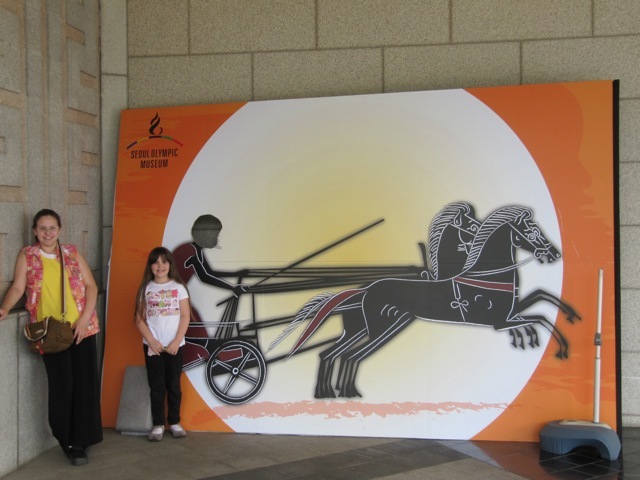 We’re studying Ancient Greece so we were especially intrigued by all of the Greek history about the Olympic Games. 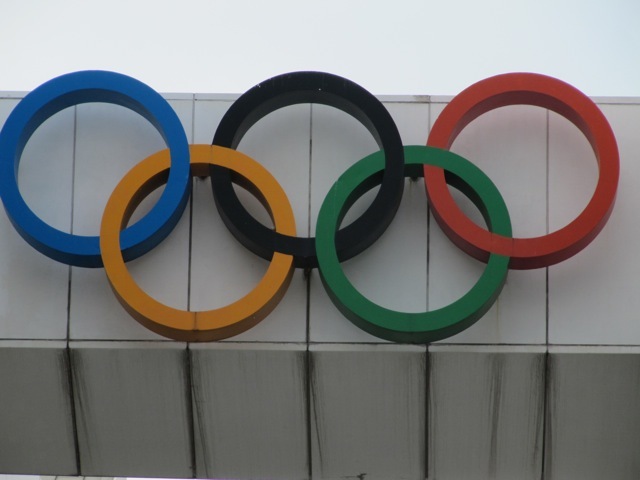 One of the facts we found interesting was that Ancient Greece Olympic athletes ate toast for breakfast during the Olympic festival. They trained all day long without stopping for lunch. However at dinner time, they ate massive amounts of food. The main menu for dinner was meat, and an athlete usually ate 3,600 g of meat in a meal. Today it is recommended that we consume about 200 grams of meat in a meal. It was also recorded that one athlete at 80 pieces of bread at once. We also learned why Greek athletes competed naked and read about the tragedy of Milron who tried to demonstrate his marvelous strength by extracting a wedge lodged in a tree. Tragically, he got stuck, and when night fell, wild animals devoured him. 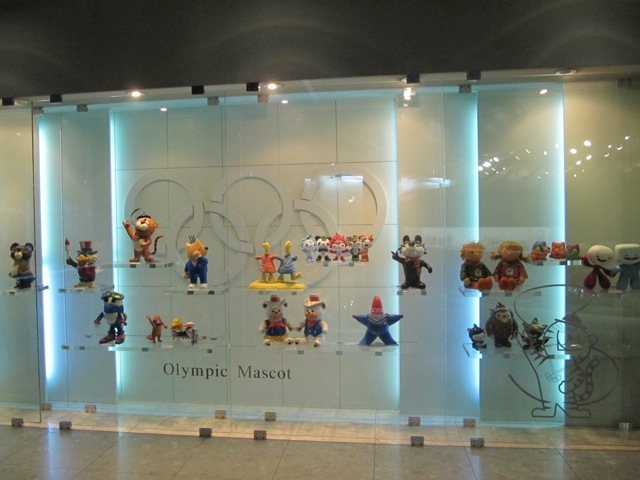 Another popular section of the museum was the display of Olympic mascots from all over the world. We had fun trying to guess which country was represented by each figure. 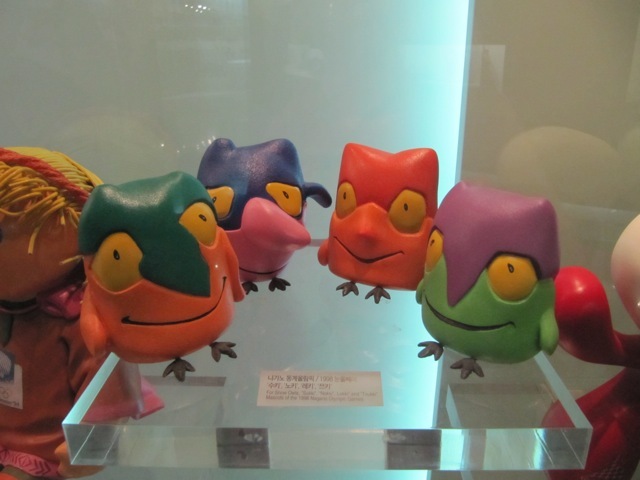 Some were obvious, like the Syd the Platypus from Australia, but others were a complete surprise, like these owls from Nagano, Japan. 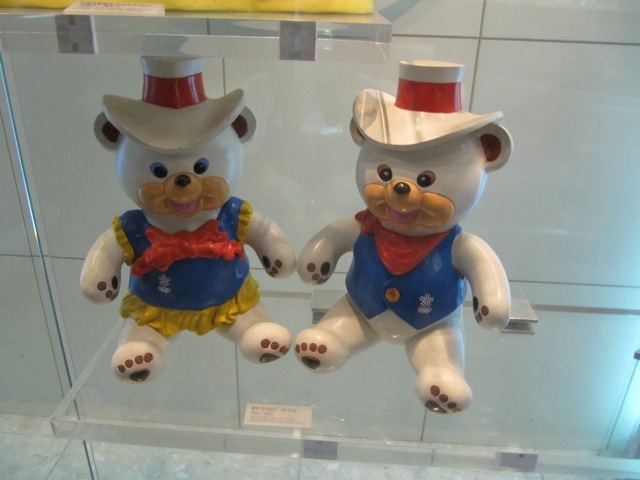 See if you can guess which mascots represented other countries hosting the Olympic games. 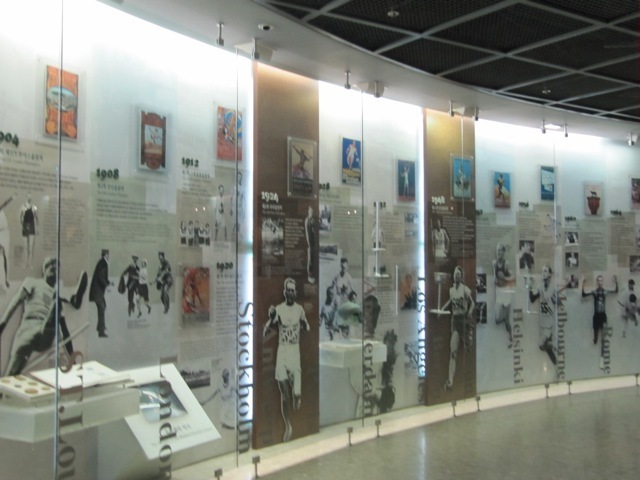 On one long wall, history and highlights from each of the Olympic games is described. 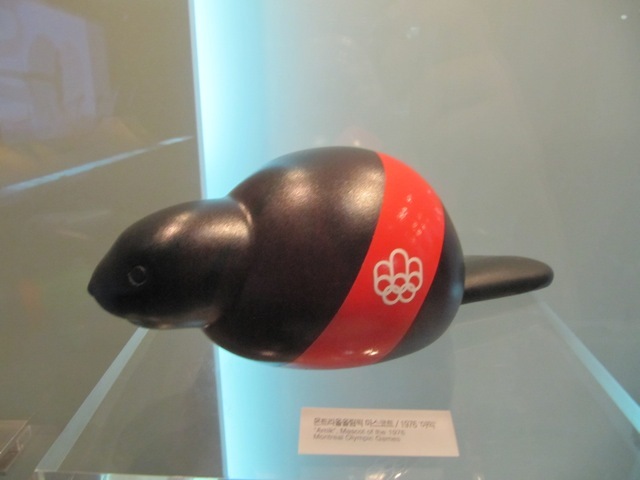 You can also see the torch used at every event. They are different each time. 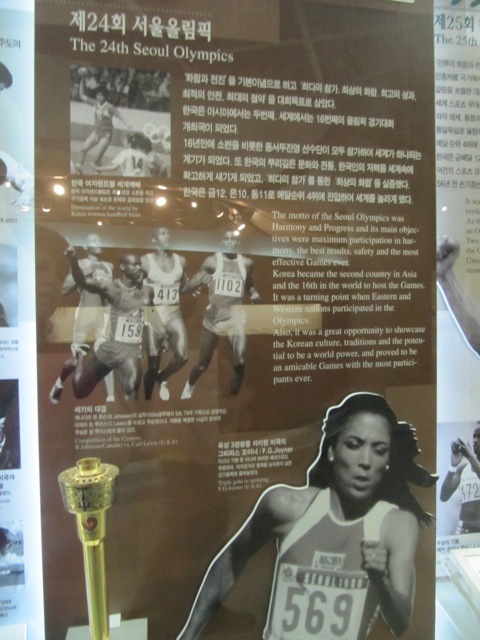 The upper floor has memorabilia from the 1988 Seoul Olympics. 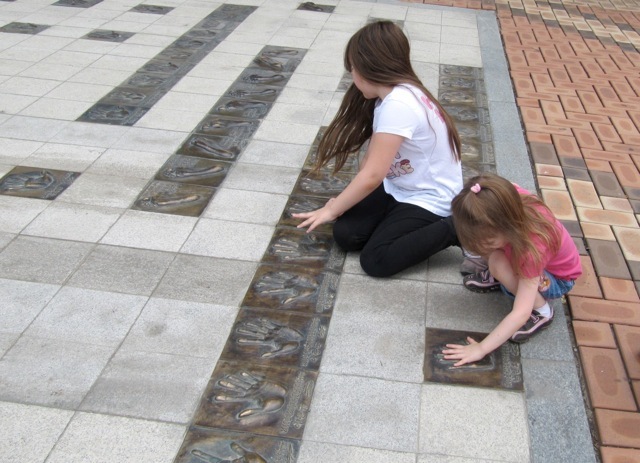 Outside, visitors can touch the spot where the ’88 Olympiads left a handprint or footprint. 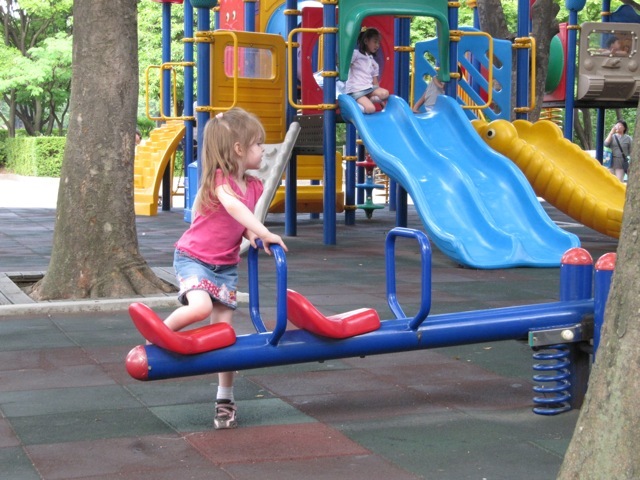 Outside, the grounds are lovely, and there are wonderful places to walk and play with kids. 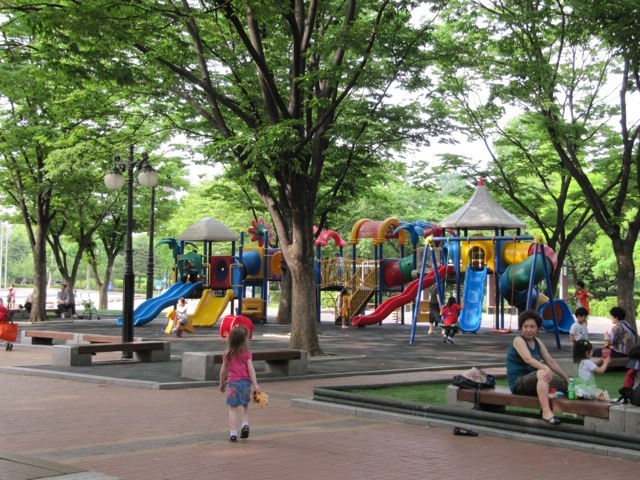 There is an outdoor playground in front of the museum. It’s shaded under some nice trees and there were several school groups having a picnic lunch. The Dalki cafe is also just around the corner so that’s an option for lunch too. This wasn’t nearly the end of our totally, wonderfully fun day. 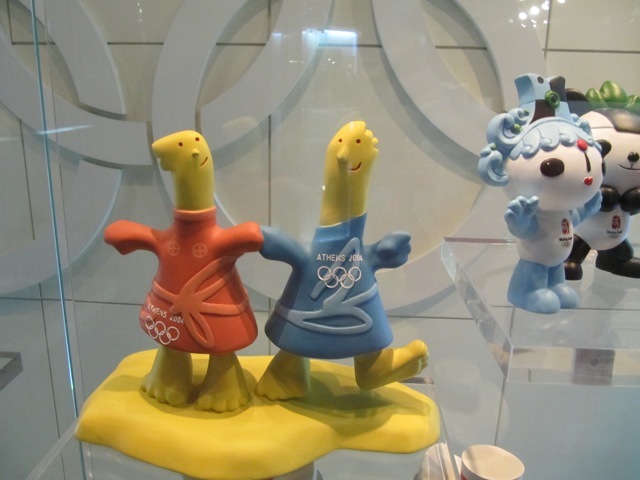 There’s more to do in Olympic Park which I’ll share in a subsequent post. Stay tuned for more ideas. 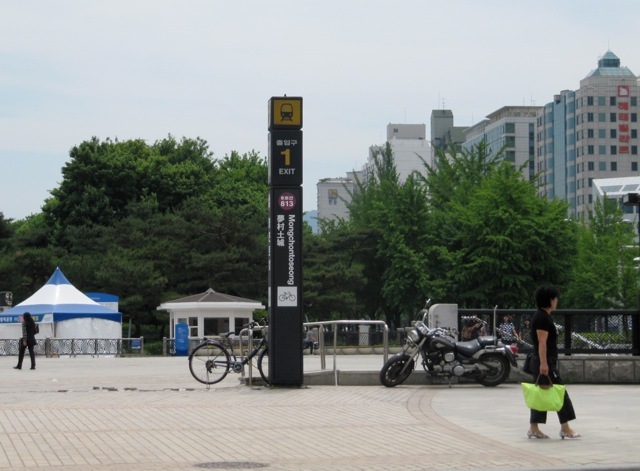 To get to the Olympic Park in Seoul, take the subway to Mongchontoseong Station and use Exit 1. 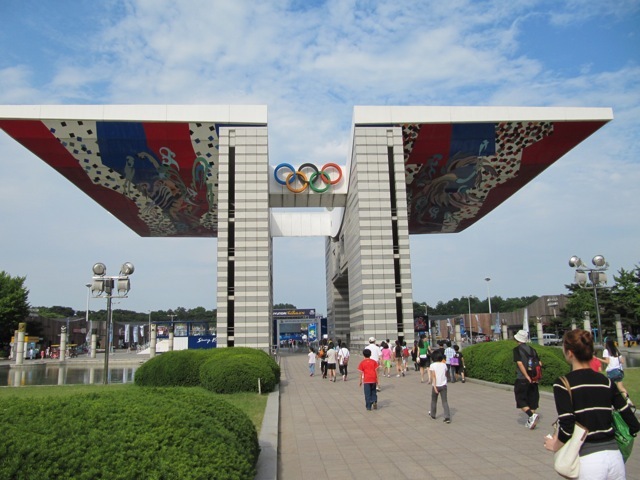 You will come out right in front of the large winged Olympic gate! 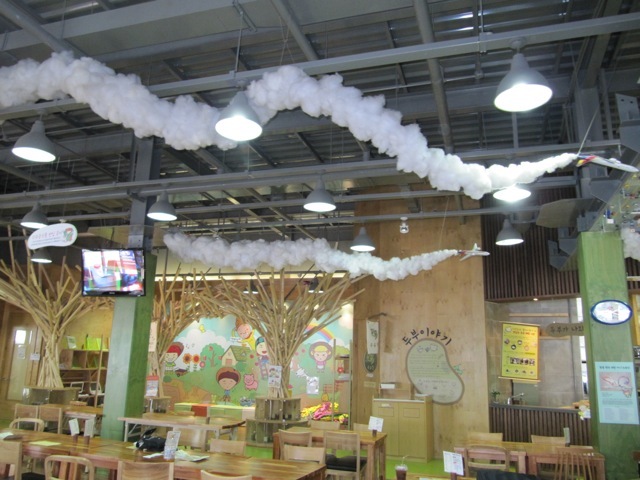 Hidden away at Seoul’s Olympic Park in Songpa-gu is the most entertaining and comical play-and-eat restaurant for kids. It was purely an accident that I found a flyer with information about this place. 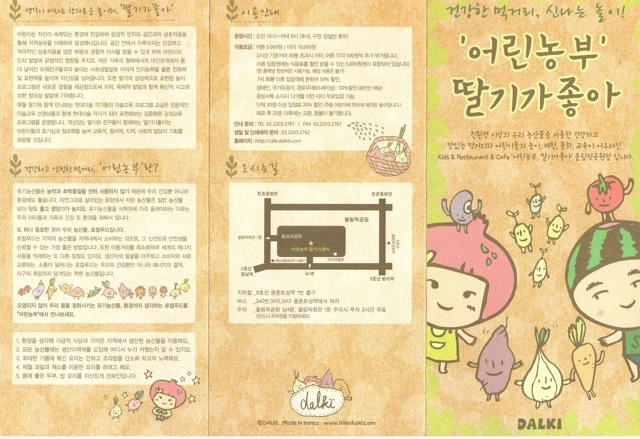 The Global Village Center translated the flyer and told me that the Dalki Cafe was in Olympic Park. 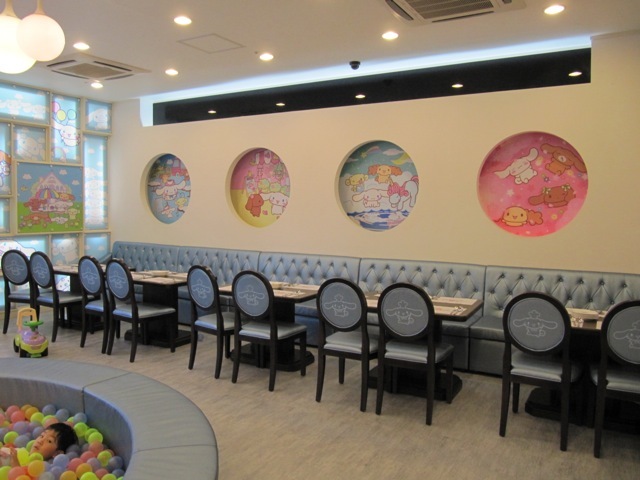 I have to admit that I love this idea of a play-and-eat restaurant that takes the food preferences and comfort of adults into consideration. 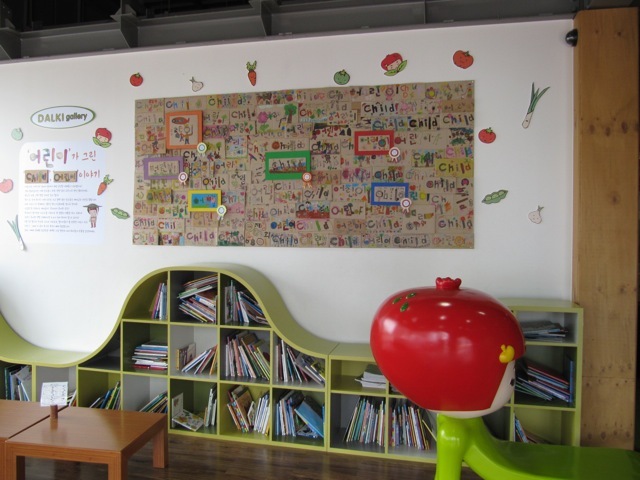 Chuck E. Cheese pales in comparison to Korea’s restaurants for kids. 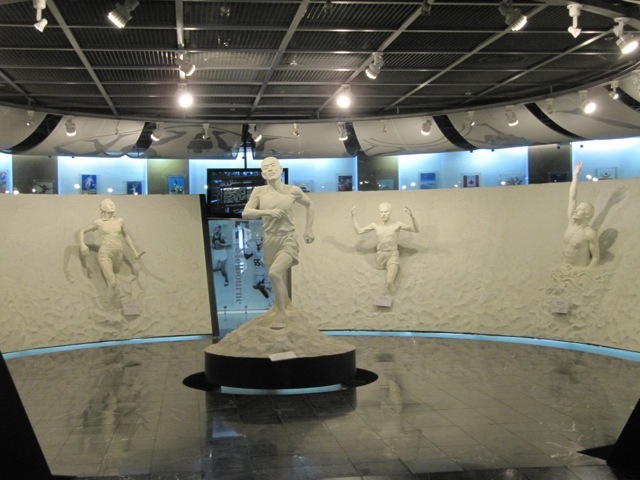 So, on a recent field trip to Seoul Olympic Museum, I asked around about the location and was pointed to the cafe which was just beyond the winged Olympic Park landmark. 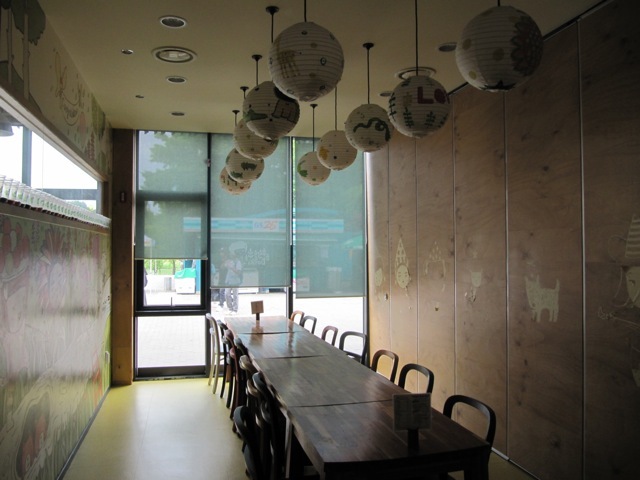 The atmosphere inside the restaurant was warm and inviting. Lots of natural wood makes the space feel very organic. 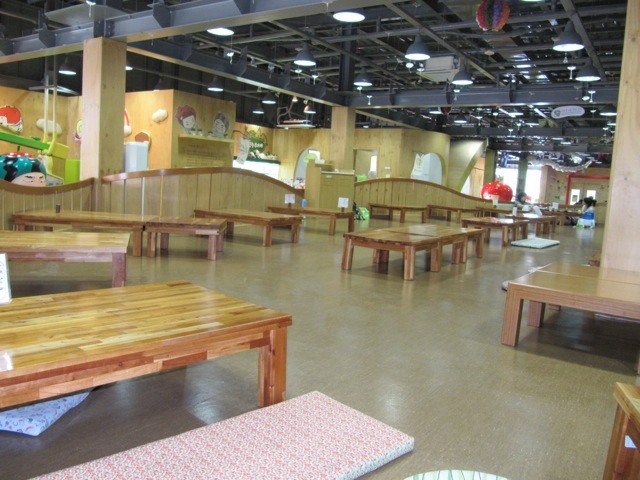 Tables were available with chairs or on the floor with pillows. 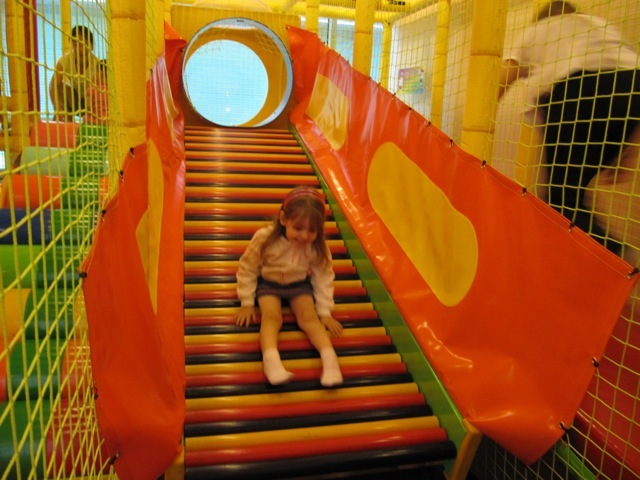 An admittance fee of 10,000W per child is required in order to enter and play. Street shoes are not worn inside the building. A locker is provided to each guest for shoe storage. 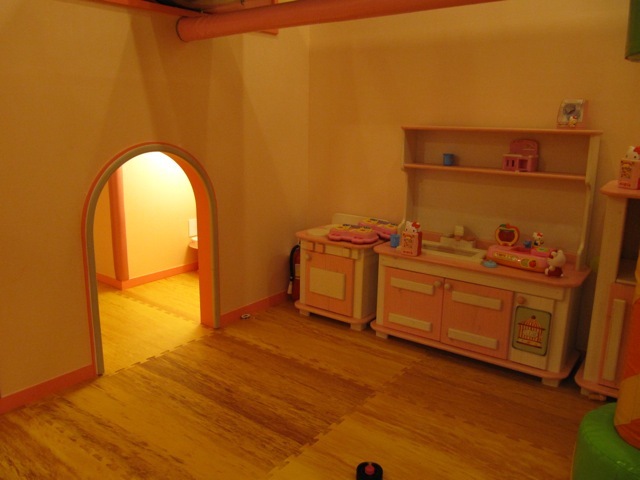 Along the ceiling beams, decorators have added a highway with little cars glued to the surface. Airplanes hang from the rafters leaving trails of cotton smoke. 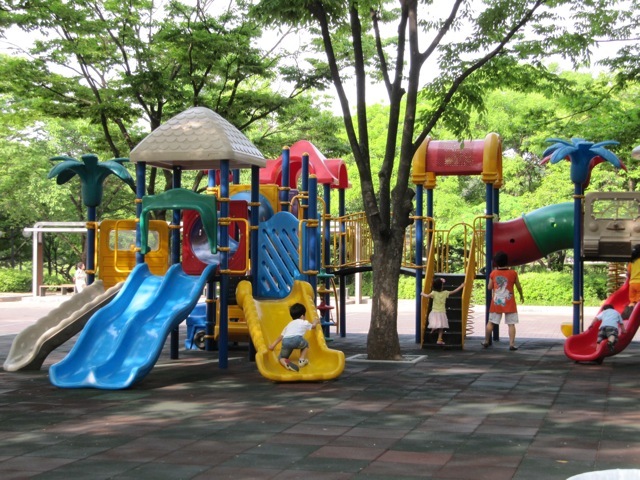 There are a variety of play spaces set up around the building — blocks and books in one corner, a computer center, bouncy marshmallow mountain, Dongchimee slide, ball pit, zip line, and more. 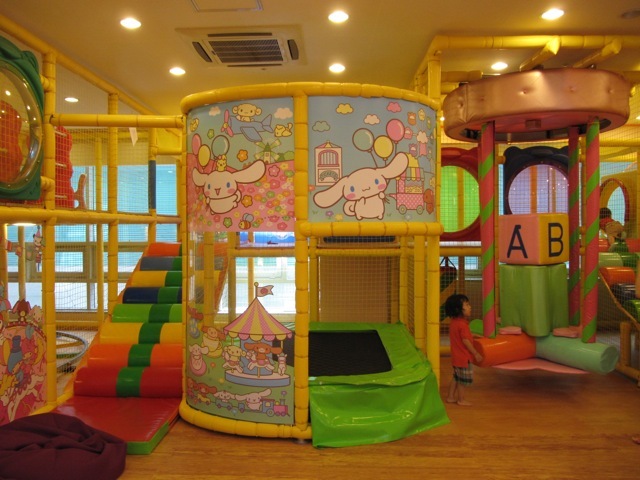 By far, the weirdest play area was the Dongchimee slide. 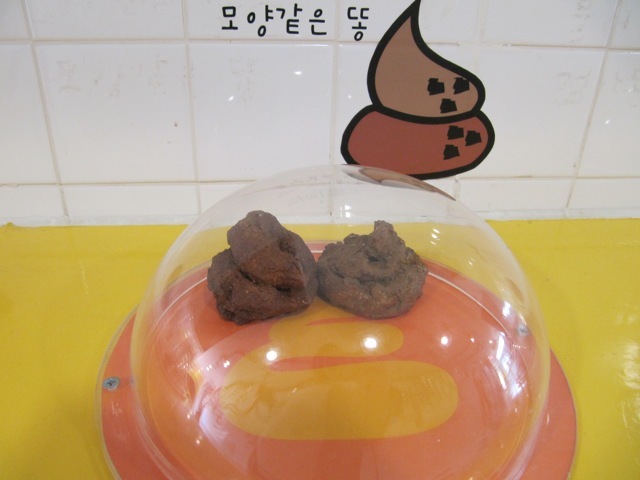 Dongchimee is basically a poop guy character who is obsessed with making poop sculptures. Apparently, dung is a playful topic to discuss with kids. 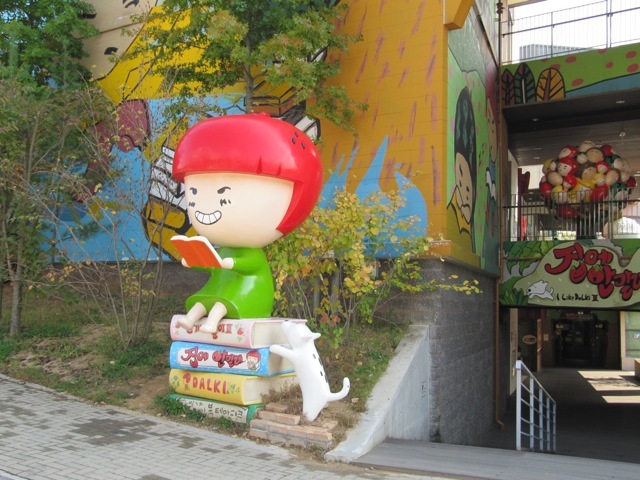 Later I’ll write about a children’s book we bought called, “Holding Poop At Night” by Choon hee Lee and illustrated by Eun sook Sim — an interesting read and quite culturally informative. 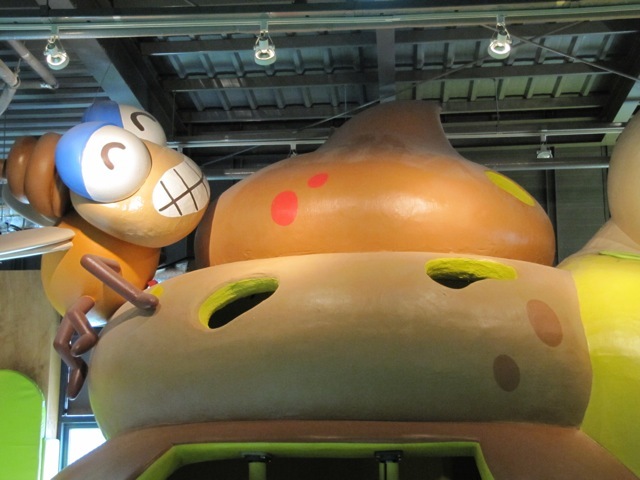 Dongchimee’s slide comes complete with a giant, swirly poop, topped with a fly. 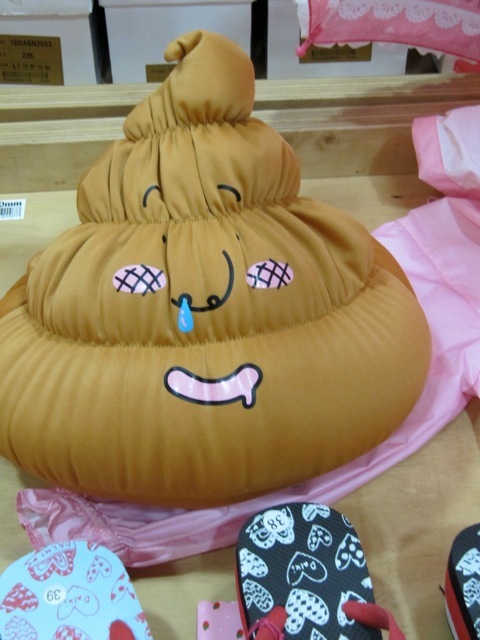 Dongchimee wears a poop swirl on his head and snot drips from his nose. 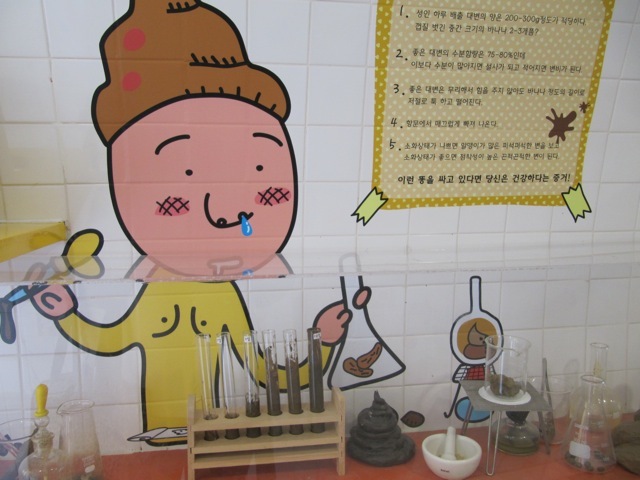 It’s just another interesting aspect of Quirky Korea that a restaurant would build its theme around a poop character! Can you imagine that happening at an eatery in your hometown? 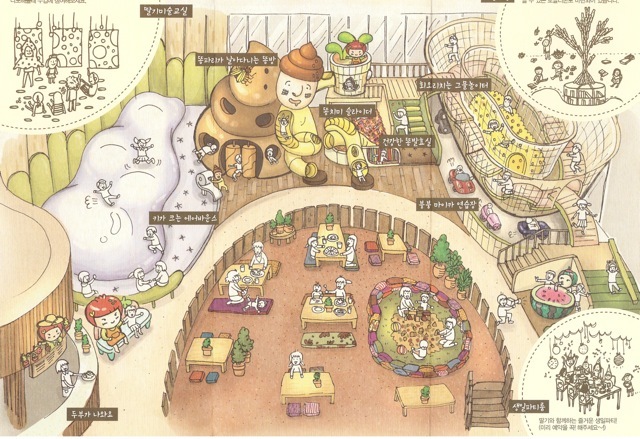 And, here’s Dongchimee with his toilet paper roll bench, followed by a diagram of Dongchimee making his infamous Poop Sculptures! 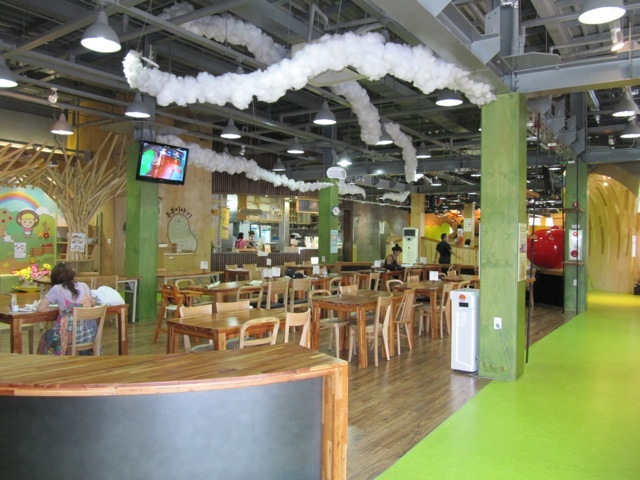 Not such a great segue into the discussion of food options, but, hey, that’s life in Korea. Lots of great food and beverage options are available, and we were happy with our meal choices. 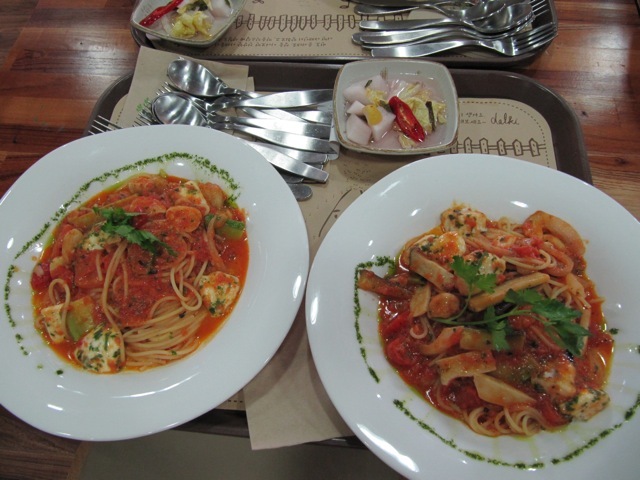 We ordered spaghetti with red sauce and topped with yummy mushrooms and mozzarella chunks. (Be sure to slice up the mozzarella as it’s a bit of a choking hazard. 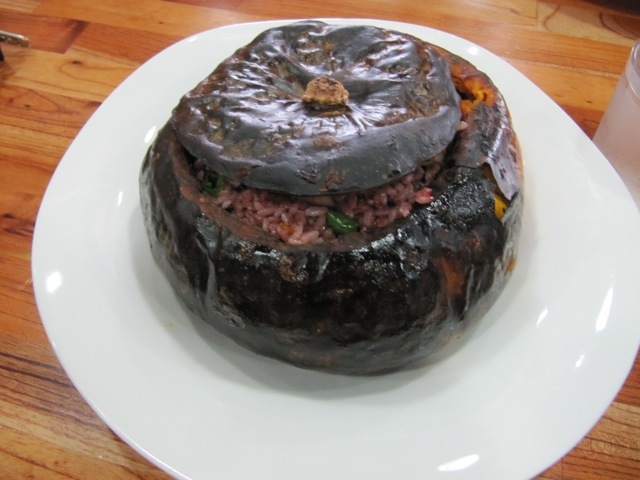 We also ordered a Kabocha Pumpkin stuffed with Korean red bean rice. 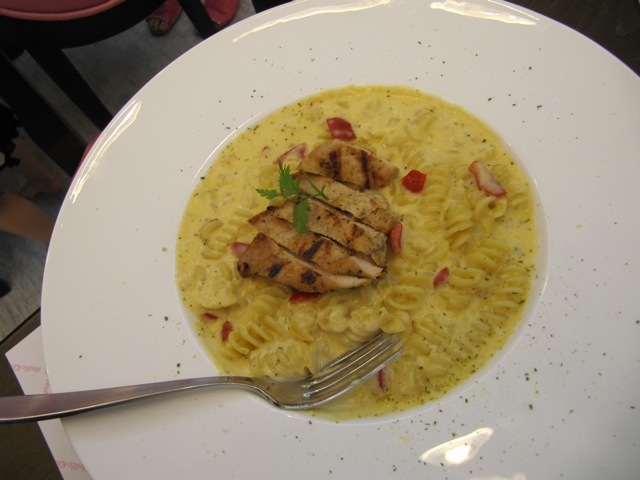 There were several choices of pasta dishes and rice dishes on the menu. The size of the meal was pretty large so I would recommend sharing between two people. The place mats were really cute and had dot-to-dot activities for the kids. This soup came with our Pumpkin and Rice. It had ICE CUBES in it which we all thought was interesting! 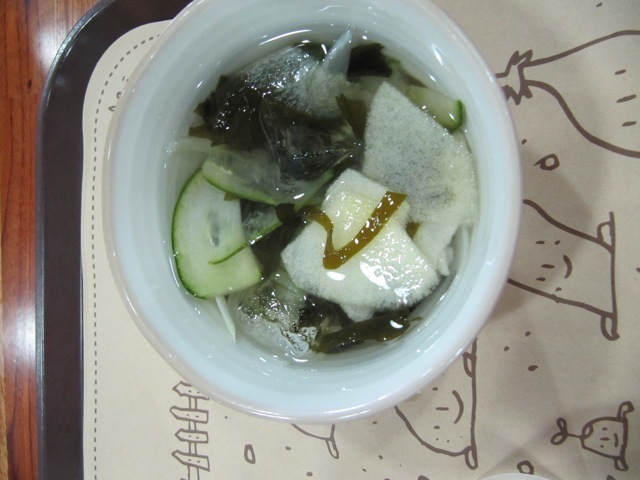 It was a pickled daikon soup with cucumber and seaweed. The flavor wasn’t bad but it was very intense — like drinking sweet pickle juice. 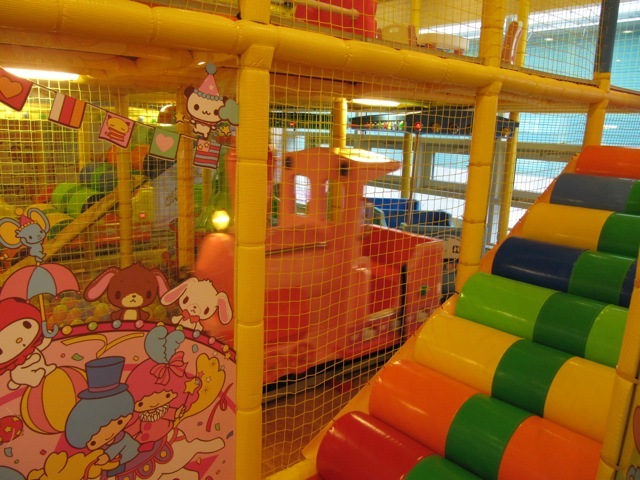 There was also a nice birthday party room, and pictures on the website indicate that a costumed Dalki character can even be booked to attend the party. 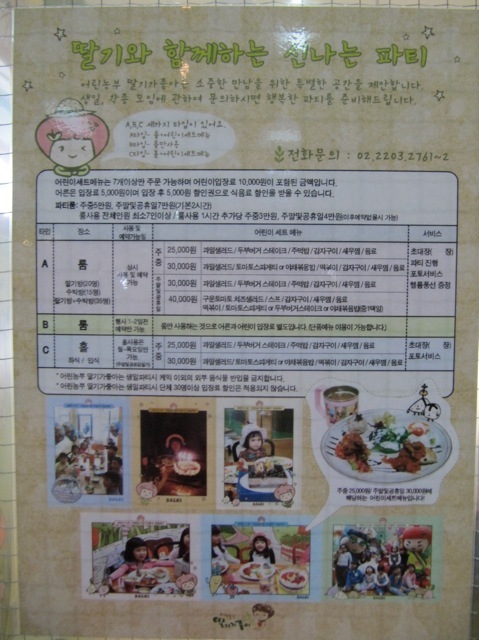 If you can read Korean, here’s a poster with the party options. 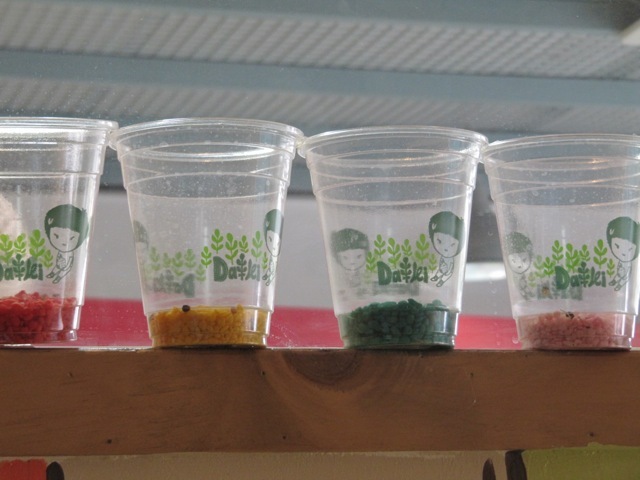 In the party room, the window ledge was lined with a row of plastic cups with colored gravel inside. I thought it was in interested decorating technique that was really inexpensive. The little touch of color in the window was quite festive. 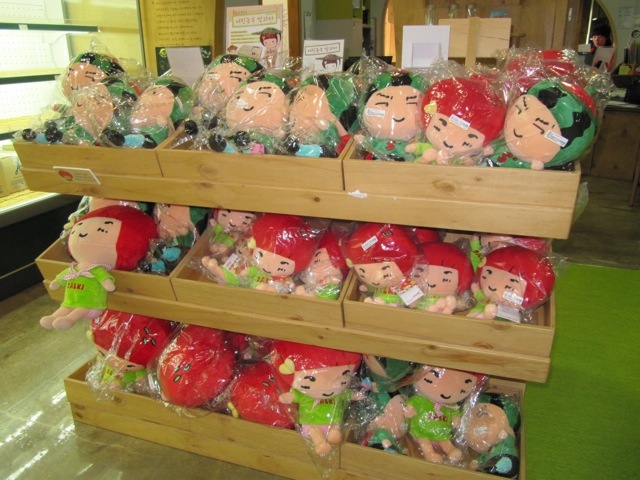 A gift shop offered several fun Dalki accessories and some organic rice and kimchi. 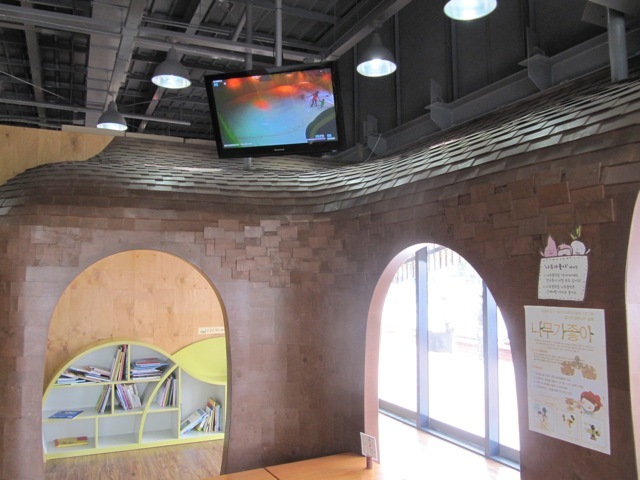 Video screens are visible from around the building to keep track of kids while they play. 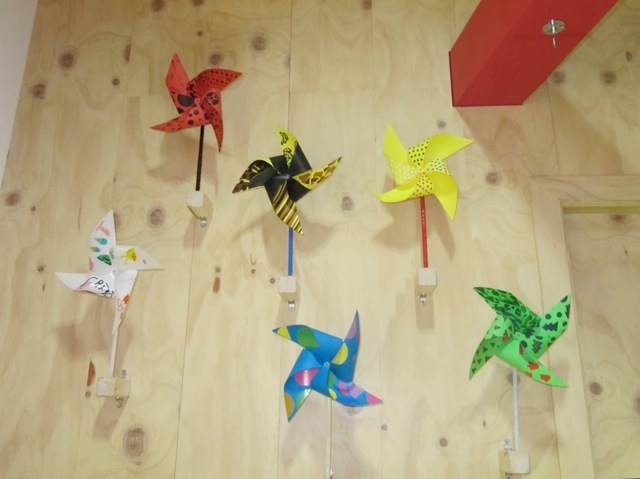 We also noticed a craft room where a variety of hands-on art projects are offered for kids. I didn’t notice the schedule, but you could call and ask. Take the Pink Line, Line 8 to the Mongchontoseong Station. 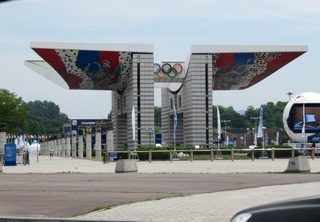 You will come up right in front of the giant Olympic Park gate. 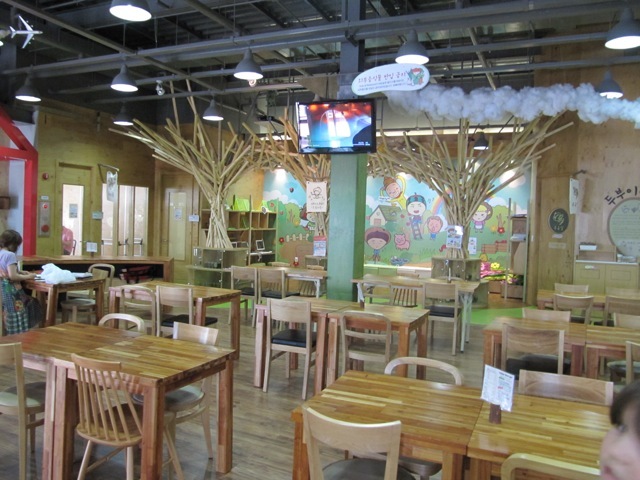 Walk through the gate and you will see the Dalki Cafe to your right. 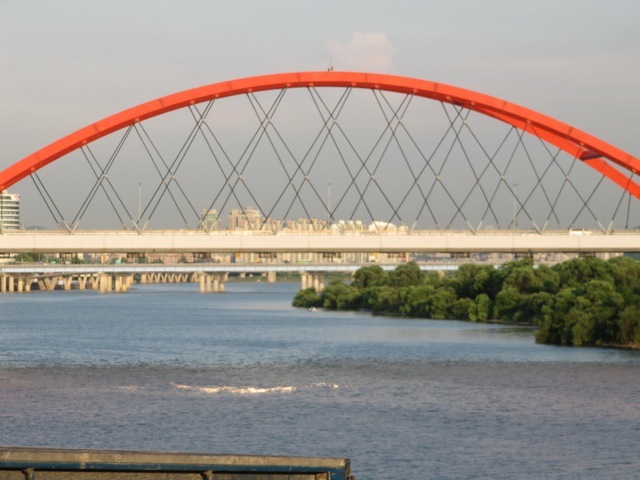 It’s about a one minute walk from Mongchontoseong’s Exit 1. After 2 hours, cost is an additional 500W per half hour. 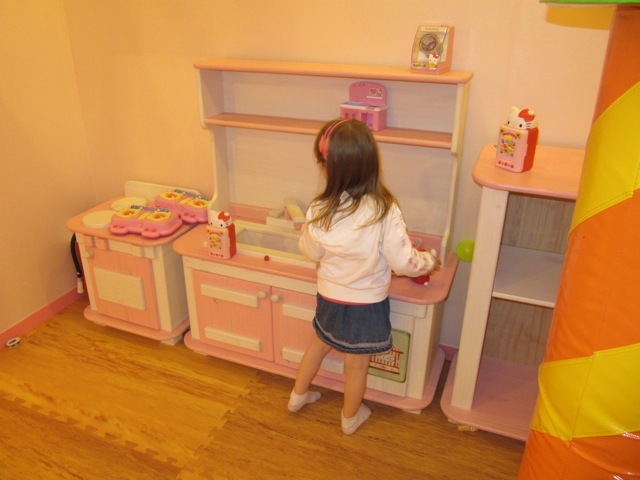 Food prices vary and food purchase is not required to play. 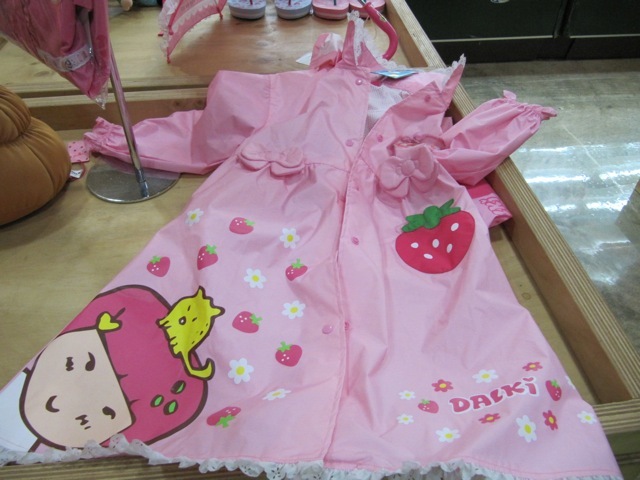 If you’ve been in Korea for any length of time, you have undoubtedly seen the popular strawberry girl character, DALKI. 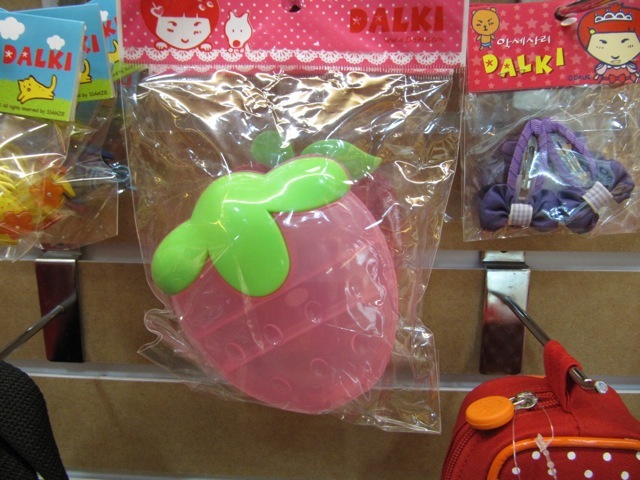 Dalki is actually the word for “strawberry” in Korean. Strawberry Girl has a close group of friends. 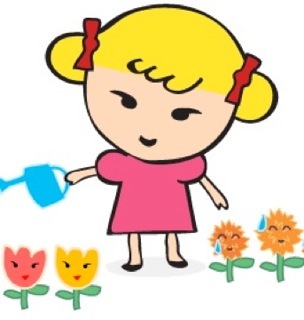 You can learn all about Dalki and her friends on the Dalki World website. 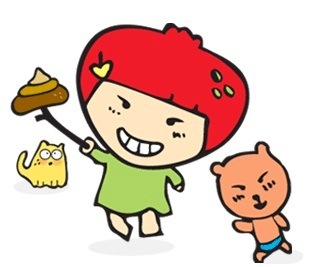 Yes, that is poop on a stick that she is holding. Dalki’s “bosom friend and counselor” is Lemon, an introspective but stubborn girl with a “cleanliness mania” who also cries a lot. 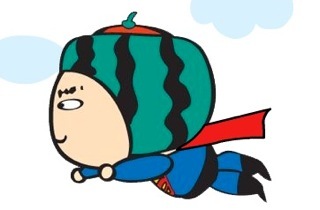 Dalki’s boyfriend is Subak, or Watermelon. She likes him but she also ignores him. Typical. 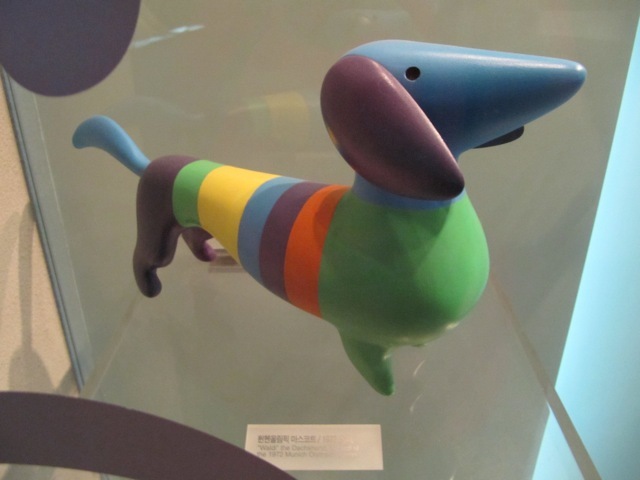 By far, Dalki’s most…er…interesting friend is Dongchimee. Dongchimee loves Dung very much. It is his own creation. It is hard to adjust and makes him feel good every morning. Dongchimee tries to test to have creations. He sometimes makes dung watery or dry. He makes sketches of such satisfactory dung and put it in a glass bottle. Dongchimee spends most of time at home. He sticks out dung of others unconsciously when he is outside. He can’t stand just watching it. That’s why they call him “Dongchimee”. 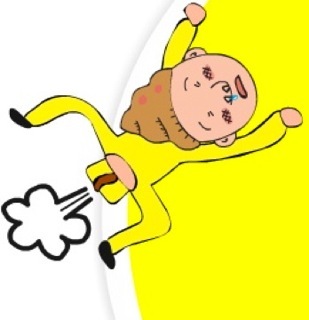 “Dongchimee” translates to something similar to “poop stick” and probably refers to the delightful school yard practice of dung chipping which involves poking someone in the rear end. Here’s an English teacher’s account of the practice. 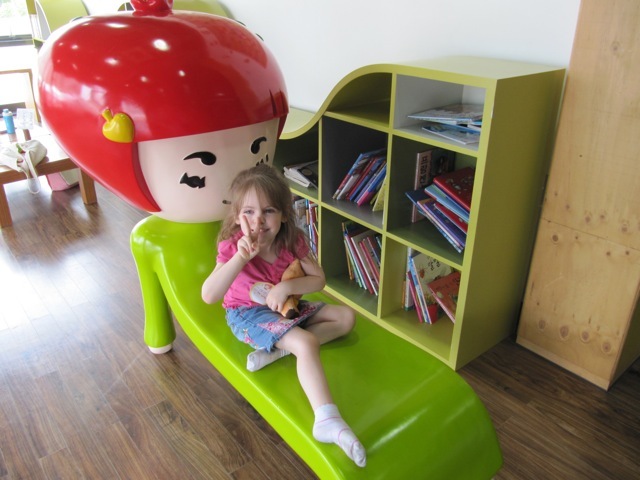 Dongchimee’s popularity in Korea can’t be missed. In Insa-dong, a food cart sells a breaded treat pressed in the shape of a poop swirl on a stick. It’s called Poo Poo Bread. People stand in line for 15 minutes just to get their Poo Poo Bread. 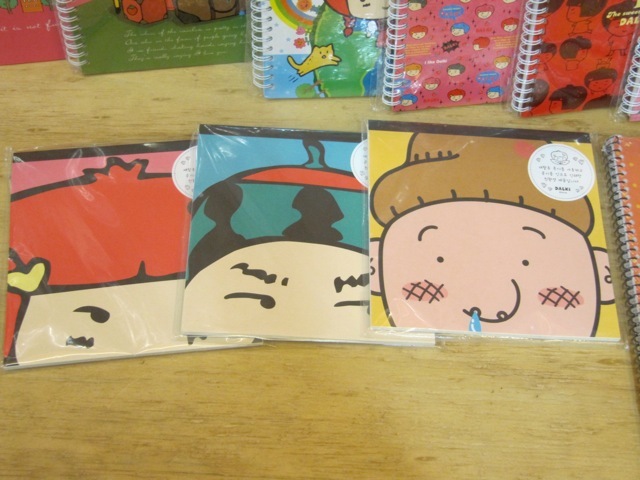 Dongchimee stationery, envelopes, pens, keychains and pillows can be purchased at Dalki shops around the area. 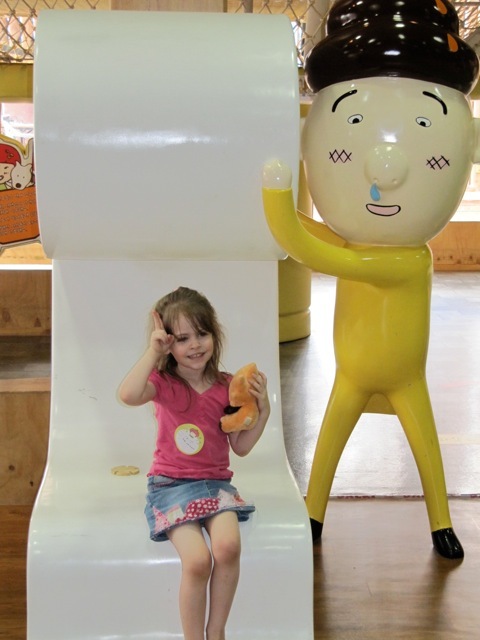 There are even play places for children that highlight Dongchimee’s passion for poop sculptures. 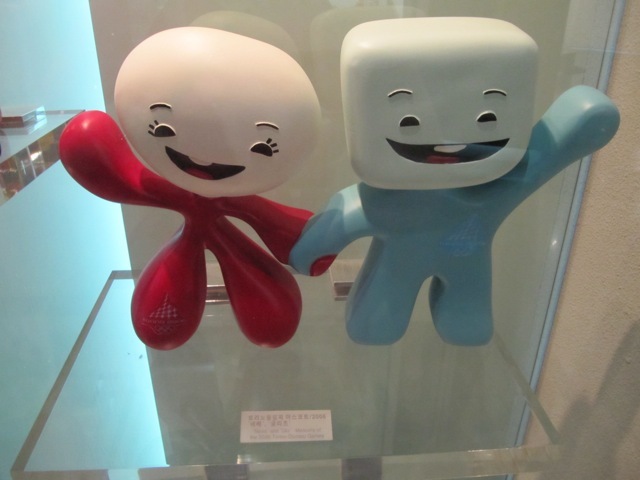 Dongchimee notwithstanding, Dalki and her friends are actually quite cute, and she is a popular icon. 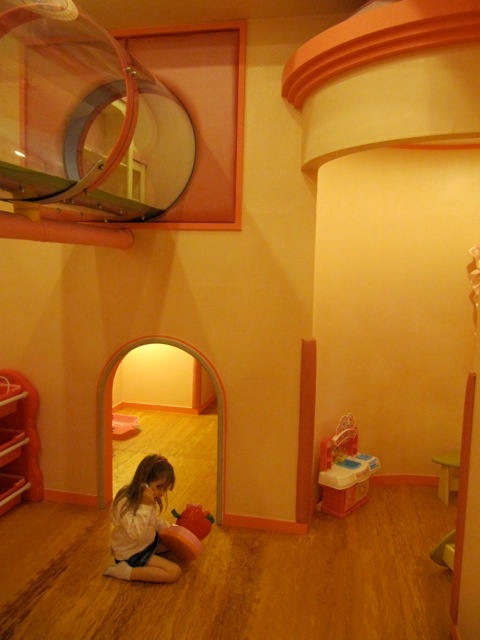 My kids and I also quite enjoy the several theme parks and play areas dedicated to her character. If Dalki appeals to you, check out some cute Dalki videos here. Yes you did see her pick her nose and pass gas in that one video. Watch some more Dalki movies here. Visit the Dalki Theme Park in Heyri Art Valley. Become Dalki’s Friend on Facebook here. You can even Friend Dongchimee here. If you have comments or thoughts to share, please feel free to post them below. It never ceases to amaze me how little one can actually know about a city in which you’ve lived for over two years. 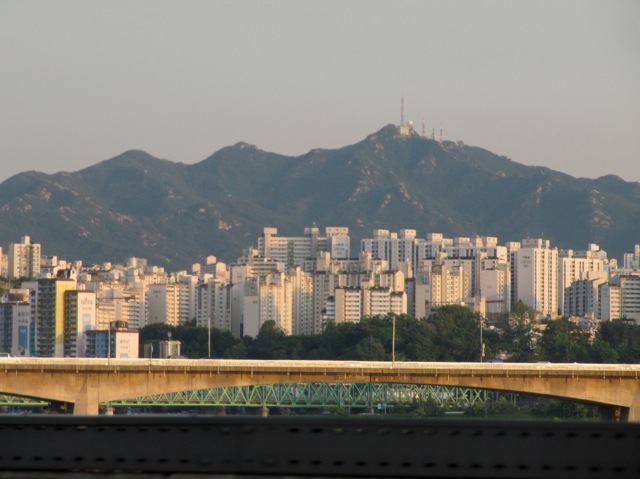 I suppose the shear size of Seoul and it surrounding areas make it impossible to know everything. 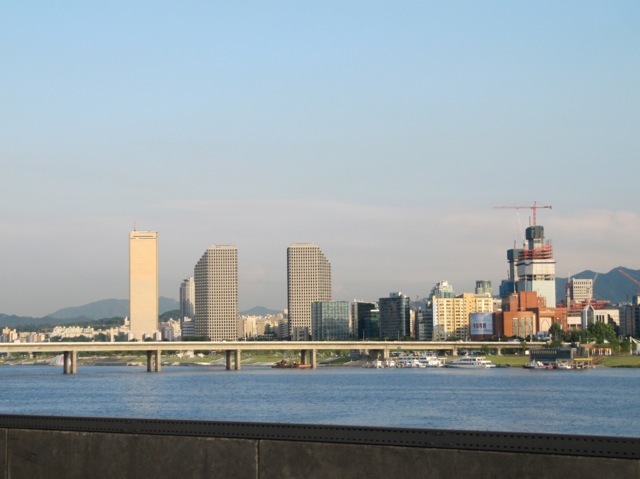 Coming from Nashville, TN, a much smaller US city, I felt I had a complete grasp of all the entertainment, amusement and museum offerings in the area. In fact, even though there were many great things to do, we were able to essentially do them all and cycle back through multiple times to our favorite spots. The Nashville Zoo was tops with us, as was the Cumberland Science Museum, Cheekwood Botanical Gardens and the Frist Center for the Visual Arts. When I think about it, there were only three science museums in Middle Tennessee. 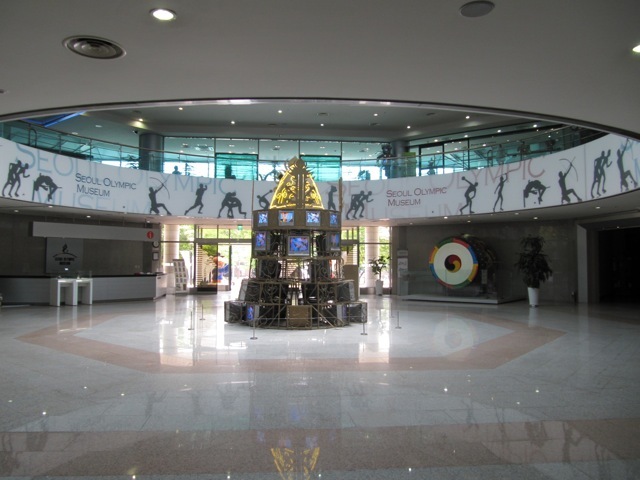 Here in the Seoul area, there are more in the neighborhood of seven and the Gwacheon National Science Museum alone, is like going to six science museums in one. I’ve been there five times and still have not seen the entire place. The thing about big cities is that you never stop discovering. My list of places to visit never shrinks even though we venture out at least once or twice a week. The more I do, the more I discover and the more I want to do. 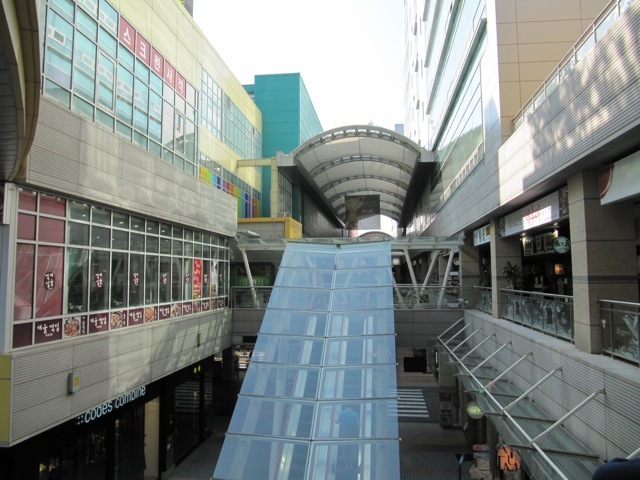 This is how I found the Western Dom shopping mall and La Festa shopping mall. 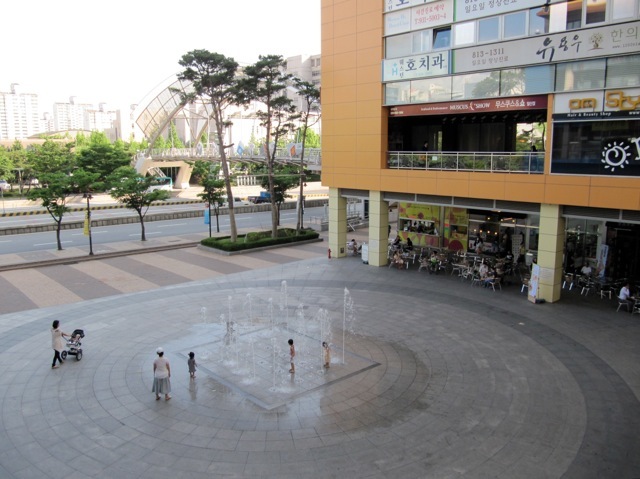 Both are in Ilsan, Korea. 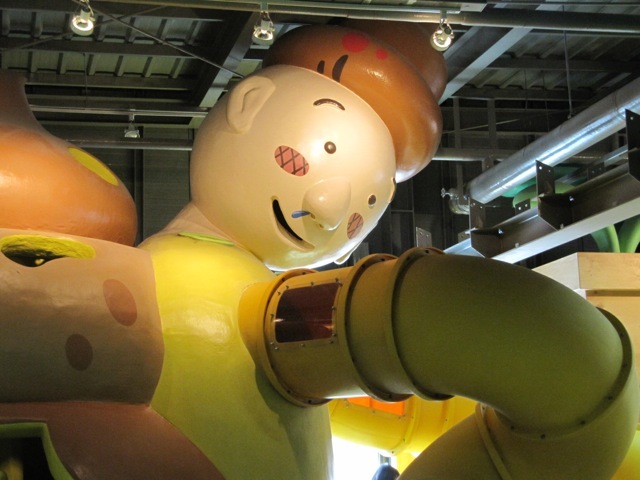 I have only visited Western Dom, but La Festa looks like a fun experience too. 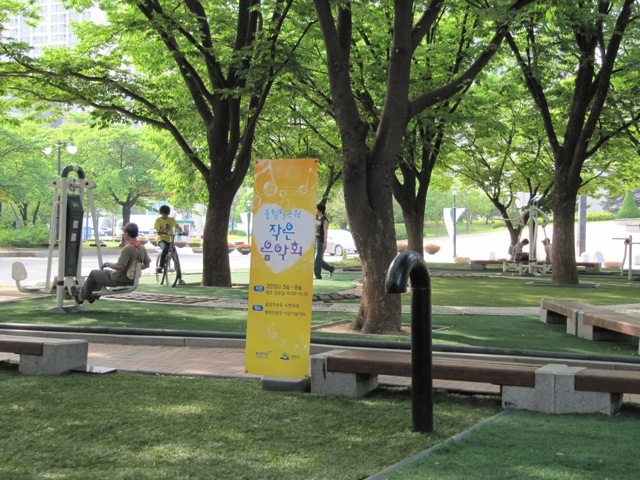 The Gyeonggi-Do website has some nice photos and an address for La Festa. 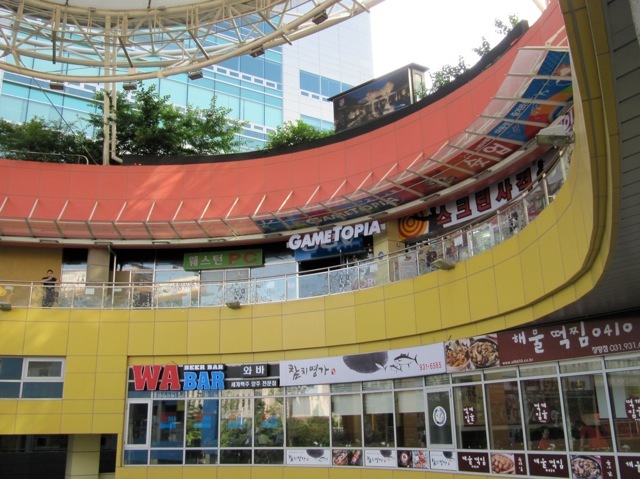 Western Dom is an outdoor mall with lots of fun shops, tons of awesome-looking restaurants, several arcade game zones, and of course, Hello Kitty Town. 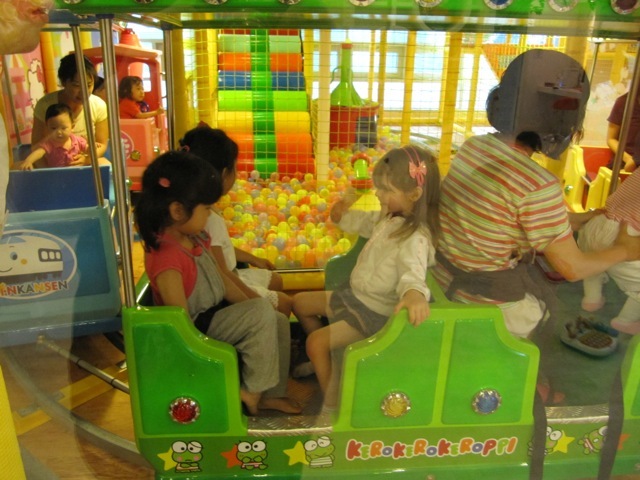 We did a little shopping and the kids had a blast in the arcade. Several of the machines kept taking our money so I had to repeatedly call the shop keeper over to dig out our stuck coin. That got irritating after a while, but we had fun with the claw game trying to get a stuffed sushi. These little critters were so cute. There was an ebi sushi, tamago sushi, and maguro sushi. We didn’t win one because these claw machines were totally rigged, but I did get the URL for the plush toy and we’ll try to order online. 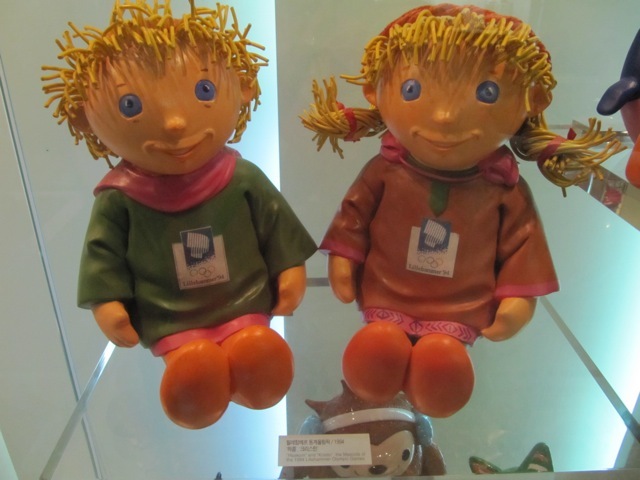 There was also a machine with stuffed tofus. 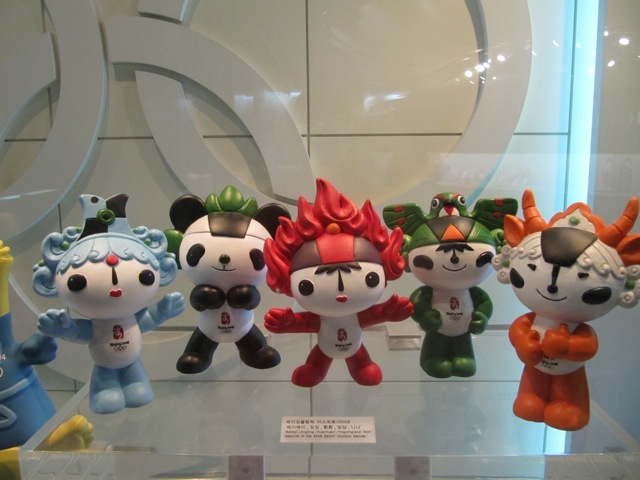 We purchased some similar ones in Japan which were much cuter, but it was fun seeing them available in Korea. We also played the taiko drum game that we loved in Japan. The kids love banging on the drums. 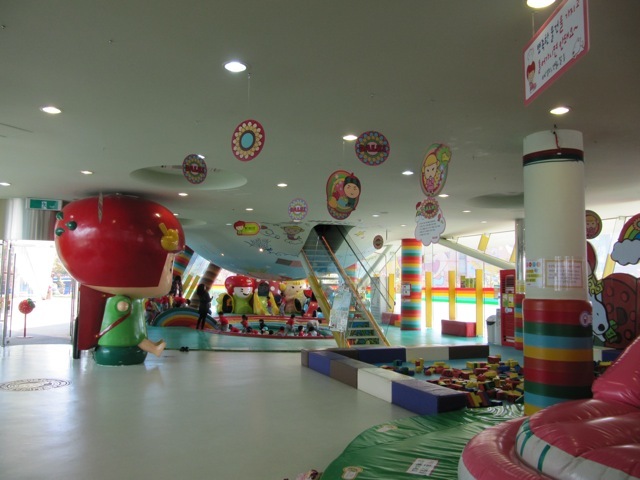 If you get a chance, take a trip out to Western Dom for a family-friendly day of fun. Lake Park is also right down the street and it looks like a great outdoor trip. 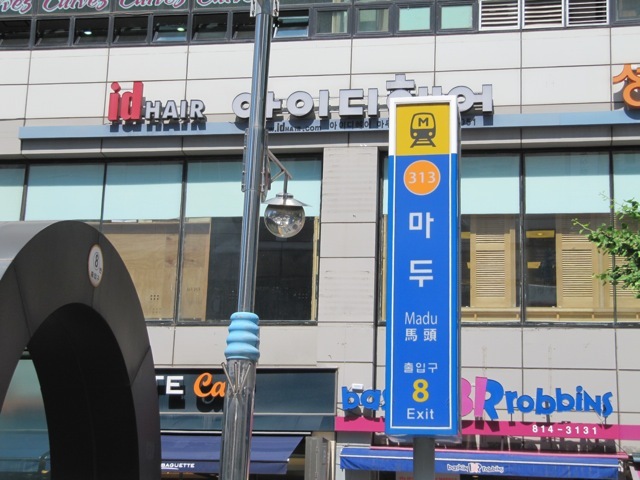 Madu Station is the nearest one to Western Dom. At the Kim’s Club (shown on the map below) take a left. Western Dom is on the right. 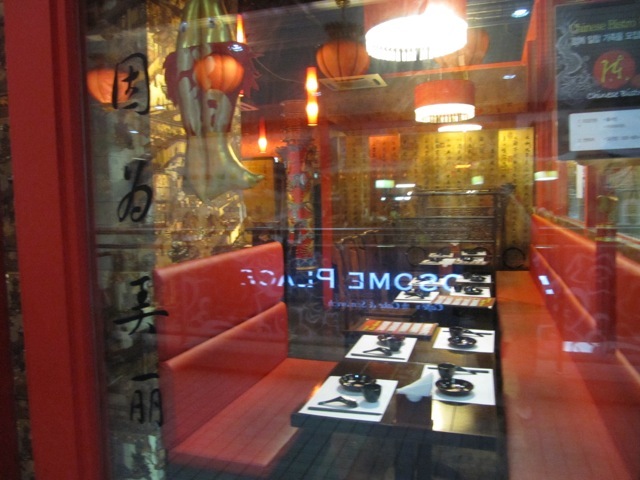 This Chinese food restaurant had a nice-looking atmosphere. 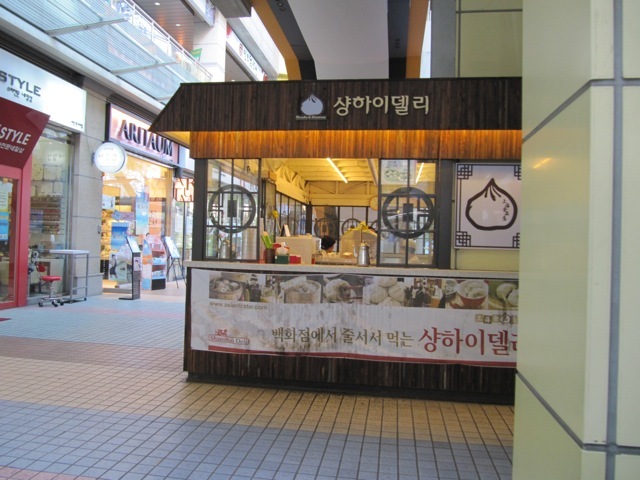 Must go back and try some mandu from this little kiosk. How convenient! An American mall would have an Aunt Annie’s Pretzel shop. This one has a dumpling stand. Lake Park is just ahead under this archway. 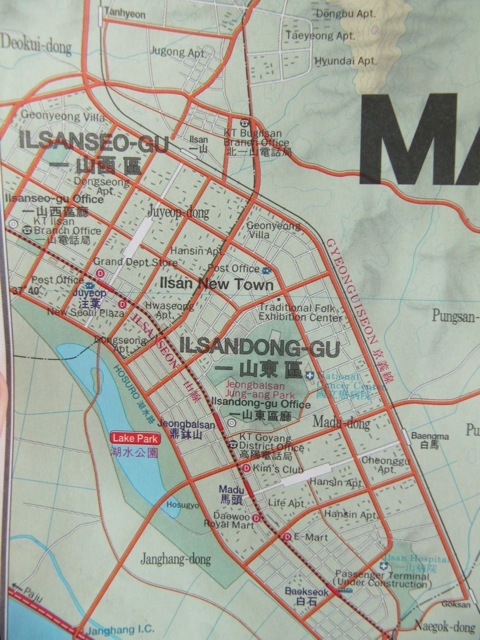 You can see it on the Ilsan map below. 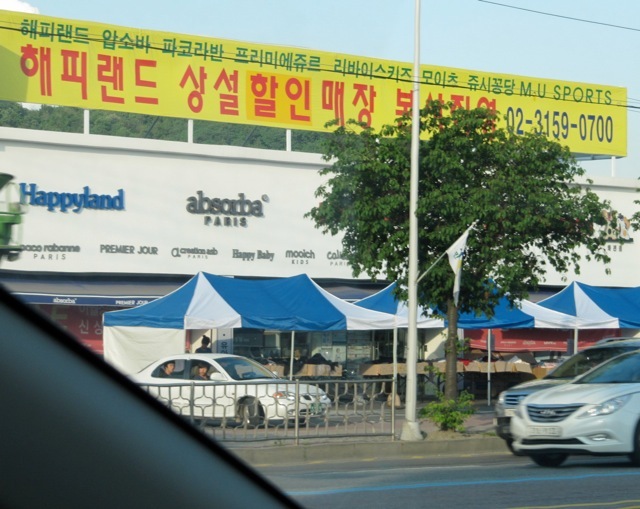 These pictures are not great, but they give an idea of the stores along the road. 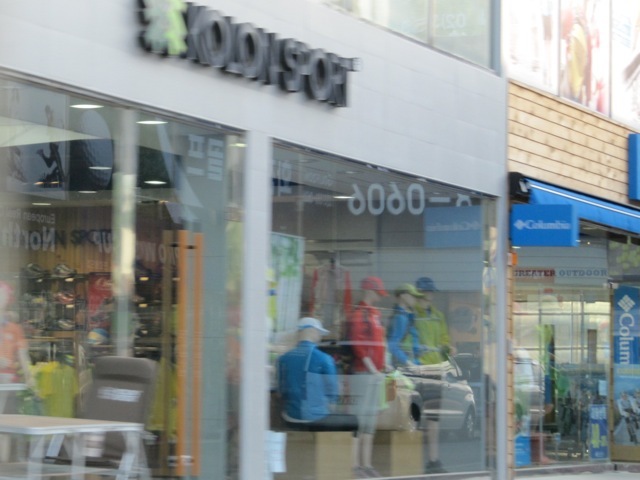 Driving to Seoul from Ilsan took me along a street with many outlet shops of US brand names. I also discovered a huge baby and kids store called Mom’s Mom. I had never heard of this store before, so it was a fun discovery. 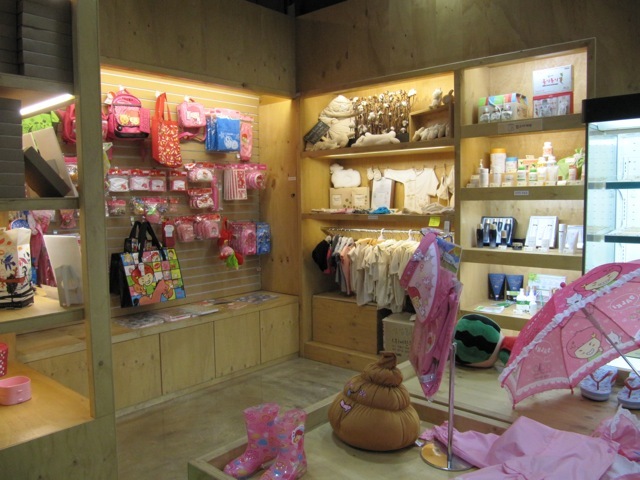 It reminded me of when I discovered Akachan Honpo, (アカチャンホンポ or 赤ちゃん本舗) the baby store in Japan. It was like the mecca of everything wonderful for babies, and I ended up shopping there about once a week. 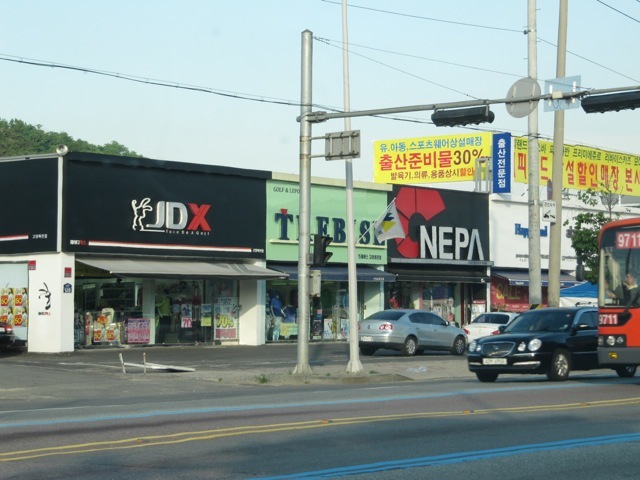 I had driven by it numerous times, but because I never bothered to decipher the Japanese store name, I never gave it a second look. 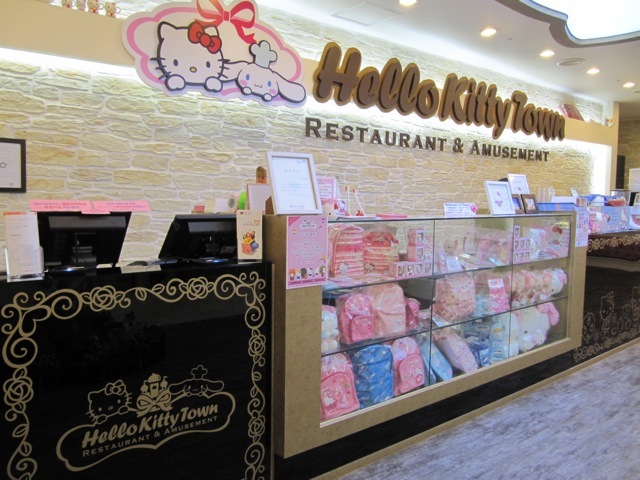 Finally, one of my Japanese friends started talking about it and I eventually made the connection that this was the store she was describing. 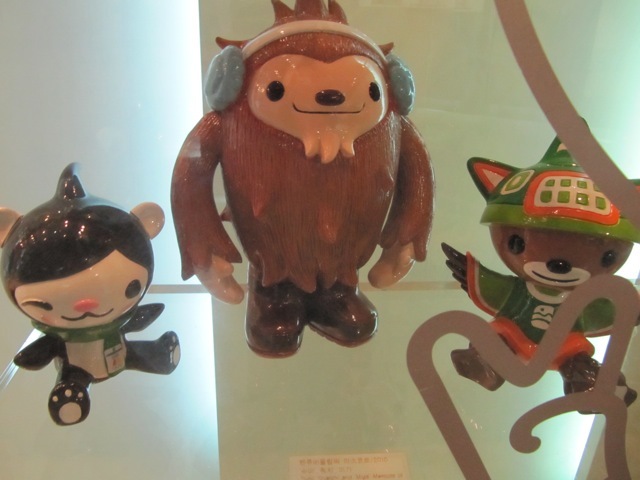 From then on, I saw Akachan Honpo stores all over Tokyo! The lesson I learned is that it really does help to learn as much of a foreign language as you can, and to use it! Learning Korean is so easy because there only a few letters to learn as compared to Japanese where they use three alphabets, Hiragana, Katakana and Kanji. 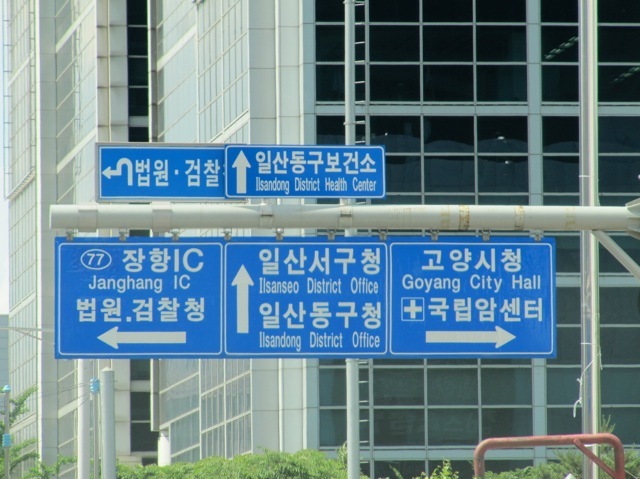 In Korea, Hangeul is used everywhere, but English is very common too, so it’s easy to ignore the Hangeul and look for English only. The problem is, when we do this, sometimes we miss great stuff. This happened to me again recently when I found a great department store called High Brand. There was no English translation so I took a risk to find out what it was and ended up at a fun new place to shop. Anyway, Mom’s Mom is a place I’ll definitely go back to check out. 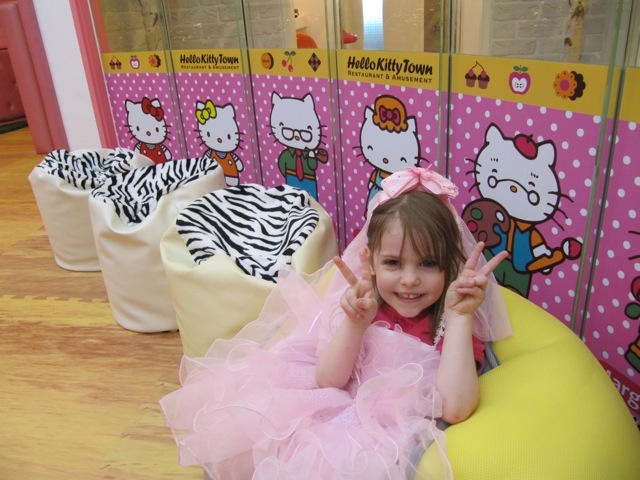 I didn’t stop on my way home because the kids were tired out from Hello Kitty Town and it was getting late. 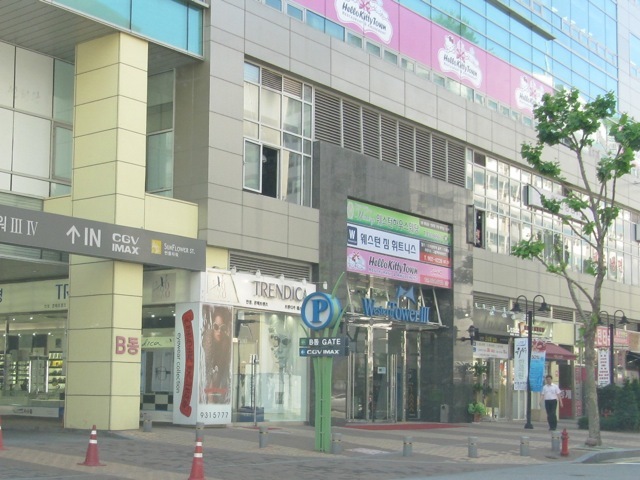 The store and the area in Goyang looked a little run down, as if they don’t get much business, but there were so many stores along the way so maybe it picks up more on the weekends when city shoppers take a little road trip to the outlet area. Mom’s Mom has Carter’s and Osh Kosh clothing, strollers, car seats, baby accessories and kids’ toys. 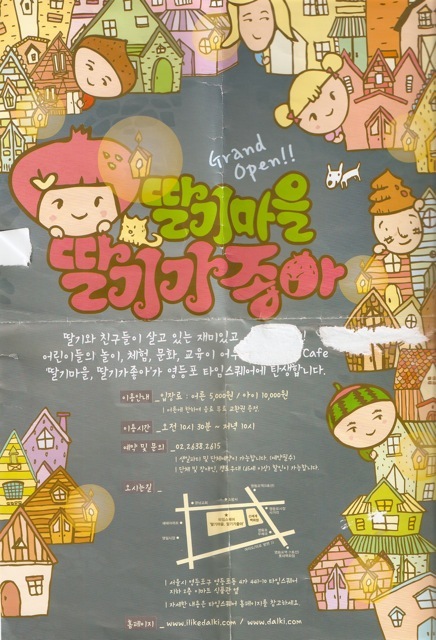 Here’s the address in Korean, to the Mom’s Mom store. What’s the first thing you notice in this shot? Is it the lady who is walking right down the middle of the street? If so, you’re a winner! That’s the first thing I notice, too. In fact, I notice it every single day when I drive down this street. 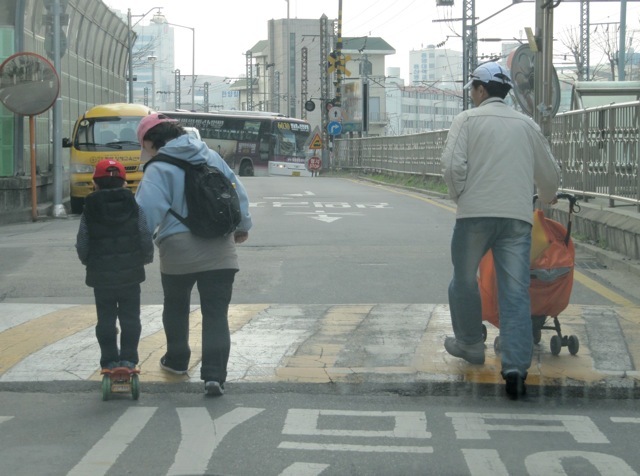 I notice that people here in Korea walk in the friggin’ road. I don’t know why. I just don’t understand. There are sidewalks on both sides of most streets. Some sidewalks are wider than the actual road. 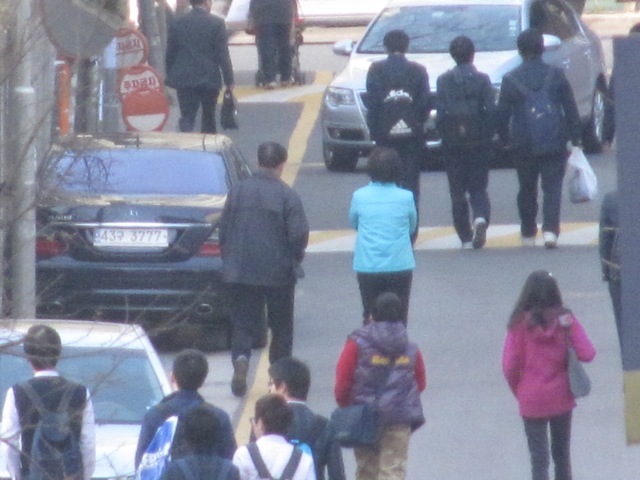 But Koreans STILL walk right in the street. Finally, today I decided I just had to take a photo of this lady and vent my frustration here. Now before you start to think, “Oh my, isn’t taking a photograph while you are driving a little dangerous,” I want to reassure you that, in fact, it is NOT dangerous when you are driving slower than an old woman can walk down the middle of the street. 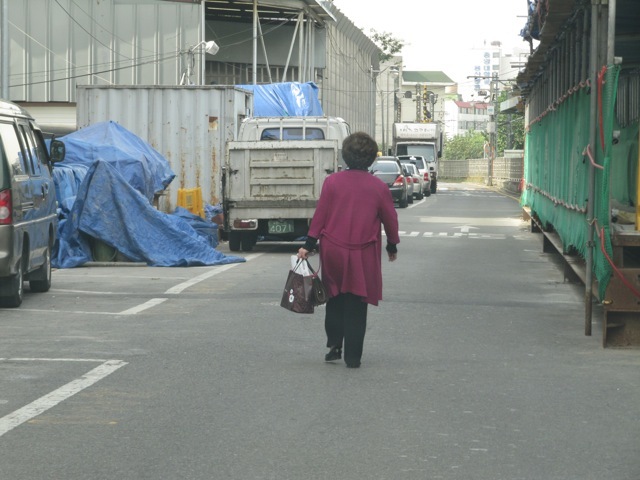 I followed her at a snail’s pace for about three minutes, afraid to beep my horn because she might fall over from fright. Finally, a car came up behind ME and got tired of me driving too slowly. He beeped and she moved. So you don’t think this is just a random, once-in-a-while sort of thing, here’s a whole family walking down the middle of the street! And, here’s one more. 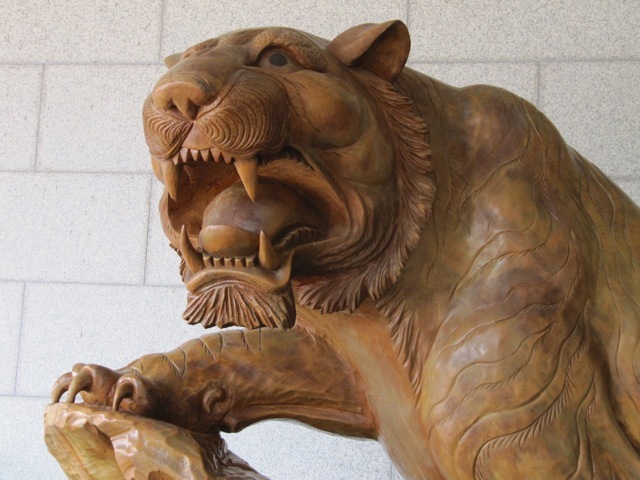 These kids are waking home from high school in Korea. The reason they walk in the street is that the sidewalk is being used by cars as parking spaces. 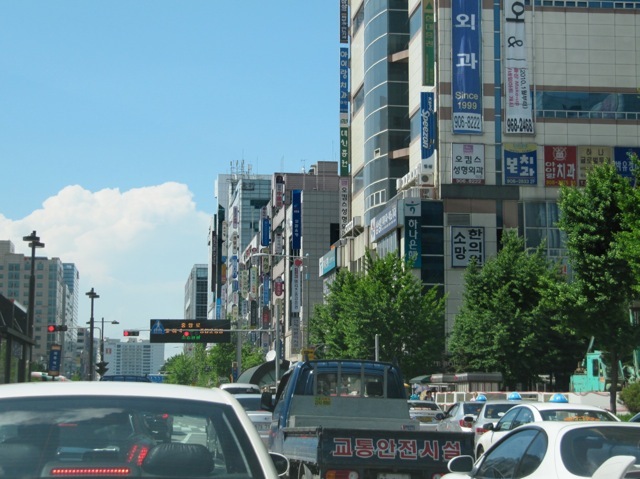 Parking in Seoul is about finding a place to put your car. Sometimes that means you just park right in the street, making a normal two-lane street a single-lane street. 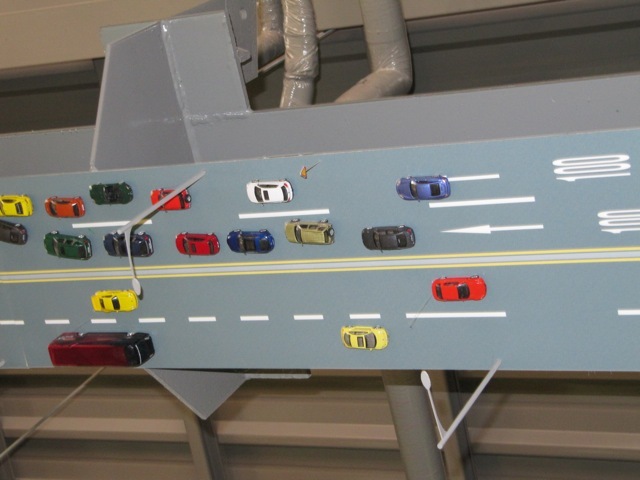 Cars then take turns driving on the single, two-way street. It’s quite annoying, actually. 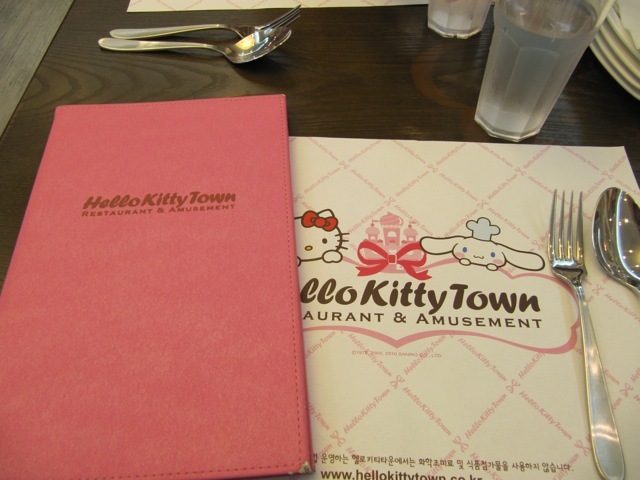 After several hours of web surfing to find out how to get to the well-concealed Hello Kitty Cafe, I came across an even more enticing link to a place somewhere in Korea called Hello Kitty Town Restaurant and Amusement. As you can guess, with three daughters, this was a place I was particularly interested to find. I knew they’d love to visit. After hours of Googling, I was unable to come up with any information about it in English. The only thing I hit on was the relatively useless website with nothing more than a single page and a thumbnail-sized map. Since I have to read Korean by picking out each letter, reading something tiny and run together is nearly impossible. Is this what non-English speakers encounter when they read tiny English print? Using my handy Zoom gesture on my MacBook trackpad, I enlarged the tiny map to almost full-screen and deciphered the address. 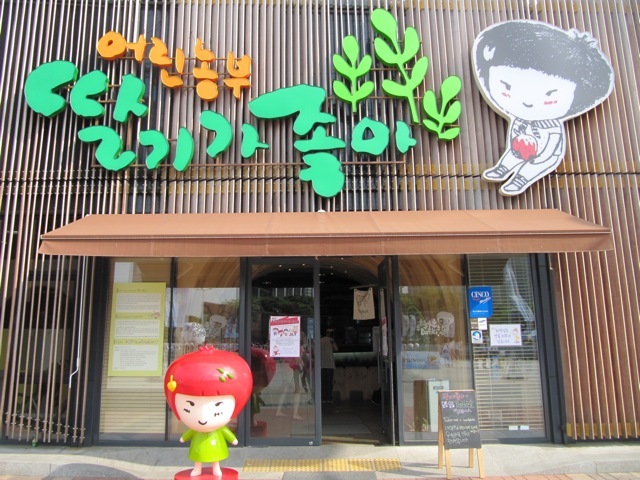 The restaurant was in Ilsan so I just had to find out where Ilsan was located. 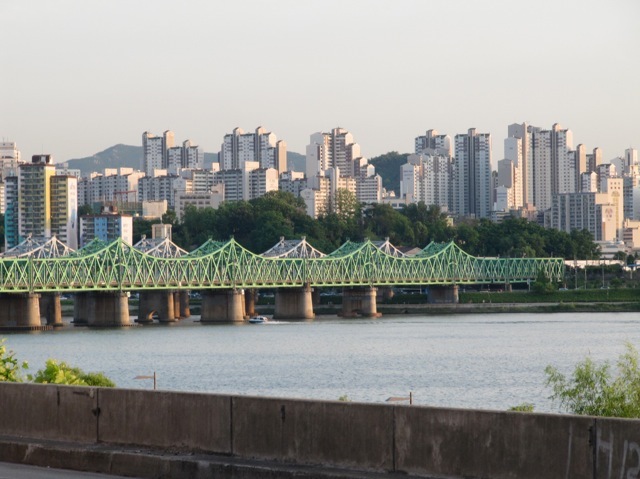 As it turns out, Ilsan is less than half an hour from Seoul to the Northwest. My map had a nice breakout of the Ilsan area and I plotted an easy route to get there. The closest station is Madu Station. 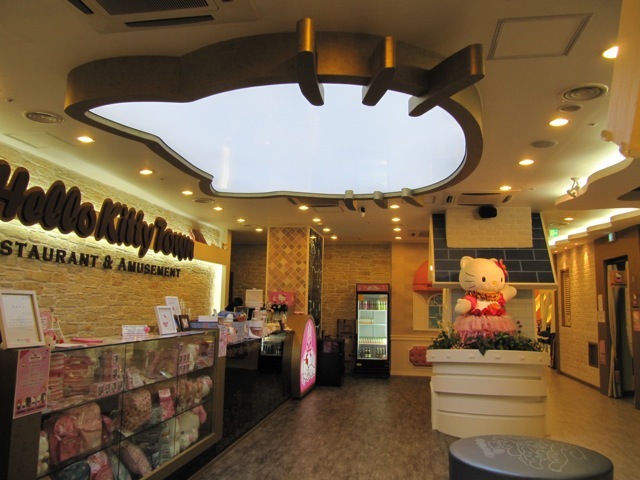 I also found out, using Wikimapia to view the area, that there was a large shopping mall called Western Dom somewhere near the Hello Kitty Restaurant. I knew if I could find this mall that I could circle around until I found the restaurant. I used Western Dom as my goal destination. 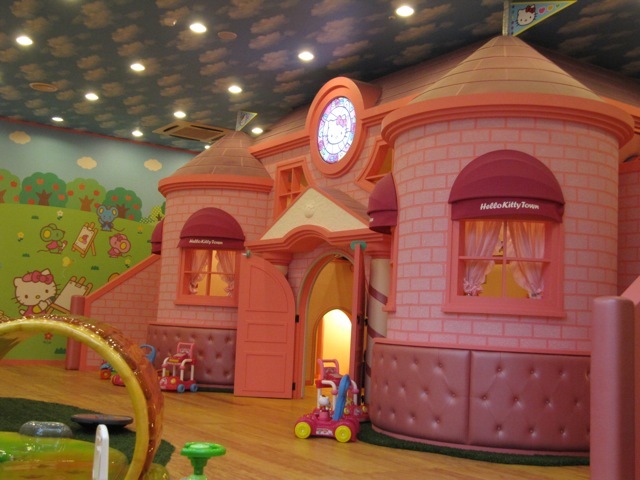 I had no trouble getting the kids to take moderately long ride in the car with the dangling carrot of finding Hello Kitty Town. I was a little nervous to venture out on my own, but I just went for it and hoped I wouldn’t spend too much time getting lost. Of course, about 15 minutes into our drive we started hearing a loud alarm coming from outside. It seemed to be coming from everywhere and I couldn’t identify any emergency vehicle in sight. In minutes, all of the highway traffic came to a complete standstill and minutes passed. I was looking at the other drivers around me to see if anyone was reacting negatively to this strange siren. No one seemed to be the least bit bothered and there were no people running frantically from their cars or screaming. Smokers were smoking, drivers were talking on their phones, workmen were snacking on rice cakes, and young girls were singing along to music. The only thing that was running through my mind was, “Gee, I hope North Korea doesn’t have some dangerous projectile headed in our direction.” Finally, a quick call to Husband let me know that this was just a 15 minute drill and everything would return to normal once it was over. I was close to just turning around and going home after the drill. It freaked me out, to be honest. But, then I decided I would just go ahead with our plans and take things as they happen. It’s not easy to stretch outside your comfort zone, but the more I do it, the less panicked I get about it when I do. All in all, the drive from that point forward, was easy and direct. My GPS sent me off the correct exit and headed toward Madu Station. 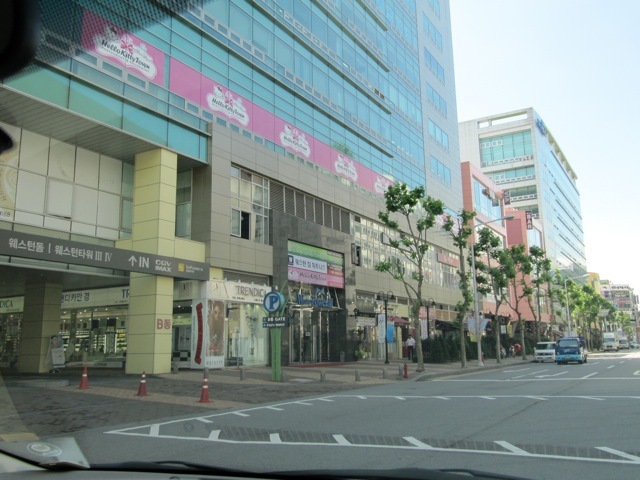 Once in Ilsan, I was very impressed with this little suburb. It was active and very pedestrian friendly. 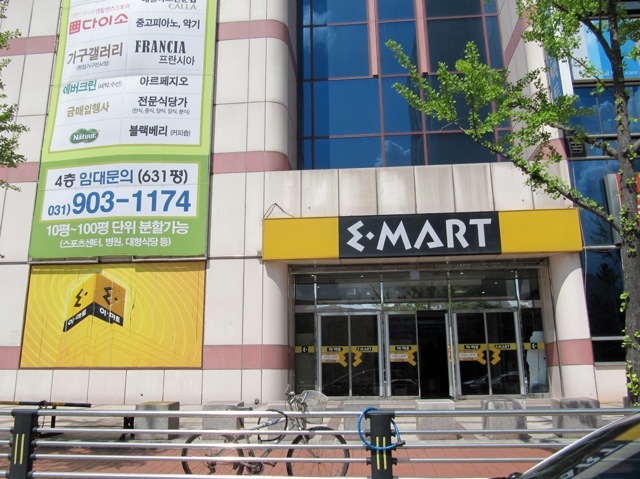 Just as the map says, I passed Emart on my right and then came to the Madu Yuk (Station). At the first intersection past Madu Station, I took a left. On this corner is a Kim’s Club and New Core Outlet Mall on the right. 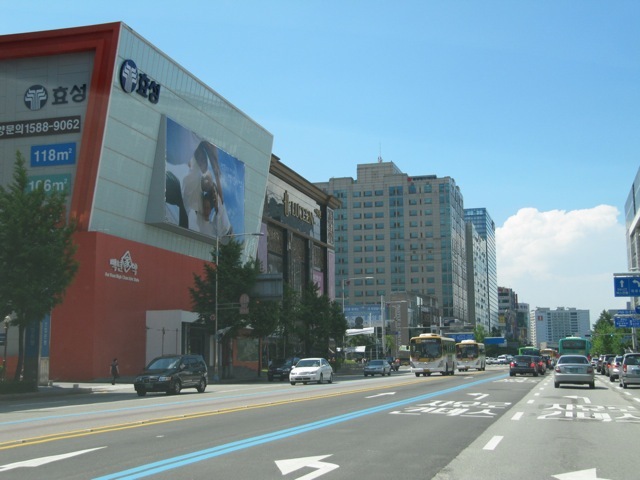 A fancy store called LUCEEN is on the left corner next to this giant red building called Hyung Seong. 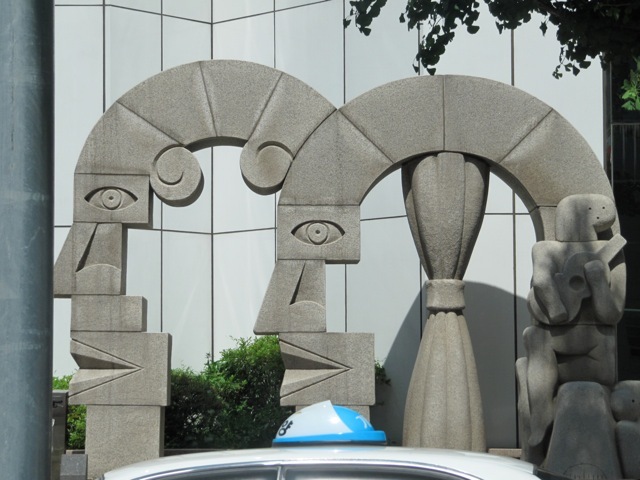 My daughter noticed these interesting faces in front of New Core Outlet Mall in Ilsan. I took a photo of the signs at this intersection too. Almost immediately after this left turn, we spotted the pink signs that ran alongside the upper level of this shopping mall. We also noted the big, blue “P” for Parking and we pulled right in with total ease. 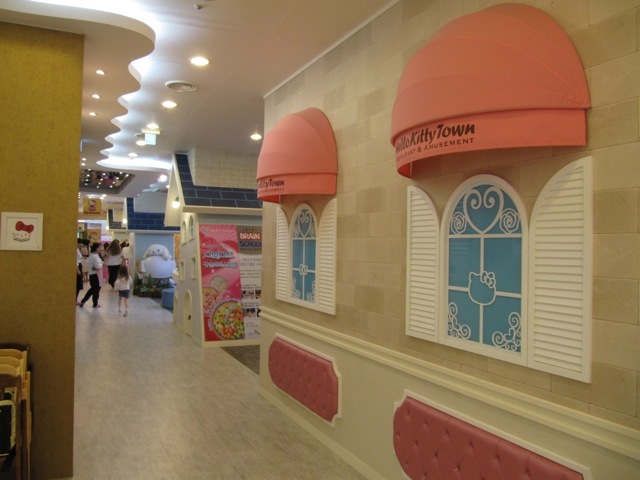 I was delighted to discover that Hello Kitty Town is actually a part of the Western Dom Shopping Center! Easy! 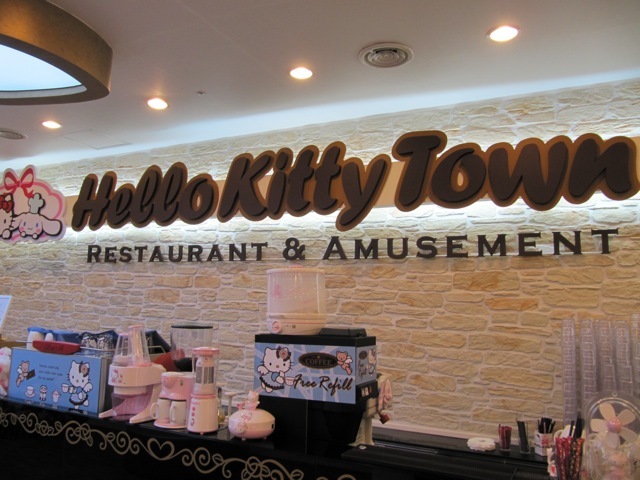 Hello Kitty Town is in the Western Tower III. Parking was a breeze. We found a space right on the main level so there was no need to even go down into the parking basements. Ok, now, finding the actual entrance to the restaurant was a bit tricky. I asked a few shop workers how to get there and not many were certain. The only real direction I got was towards the elevator and to the 3rd floor. The problem is that there is no entrance to the restaurant from the 3rd floor where I entered. 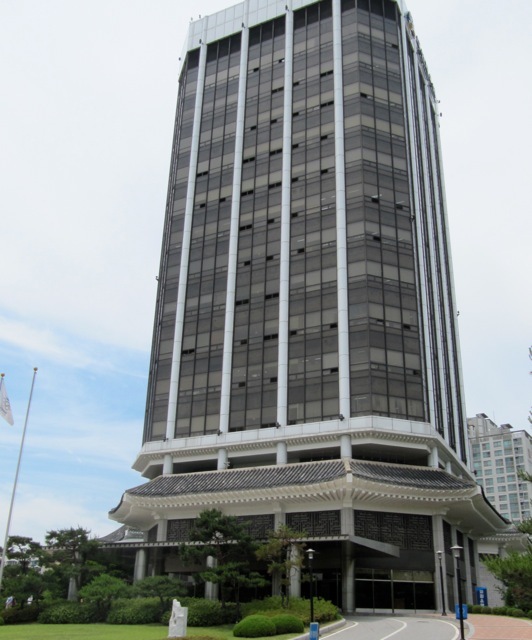 We had to go to the 2nd floor, exit the elevator, walk down the to the end of the hall and enter a different glass door to an elevator that took us up to the restaurant. The elevator actually opens inside the restaurant. There were signs on the 2nd level that pointed the way. Once inside, we were greeted by a hostess and directed to put our shoes in the lockers. No street shoes are worn inside the restaurant. 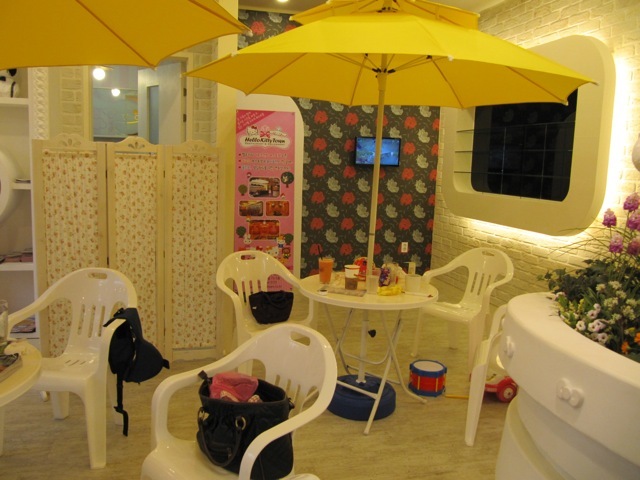 Parents and kids went barefoot or used the pink or tan slippers provided. 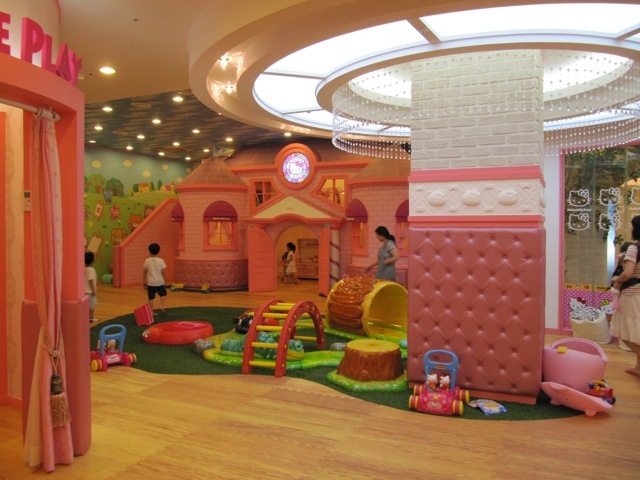 The cost for each child to enter and play is 7,000won. That included a free orange juice boxed drink. Any additional food you order is optional. Some of the moms who were there just ordered coffee beverages. Others had a full lunch. Portion sizes were pretty big so I would recommend that you have at least two people share each dish. 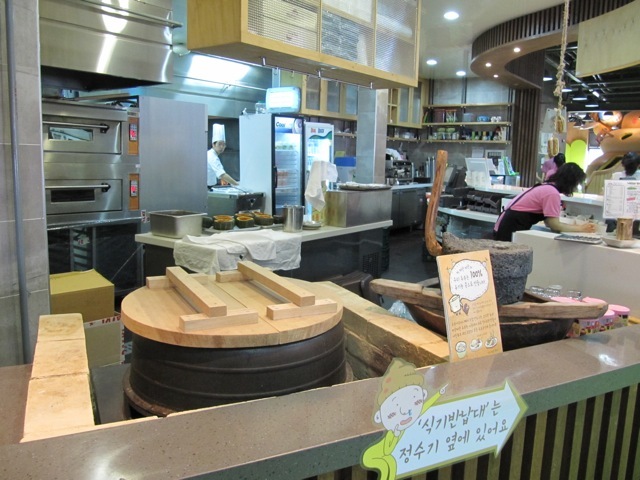 Food prices were moderate to high ranging from 12,000 to 35,000 Won. 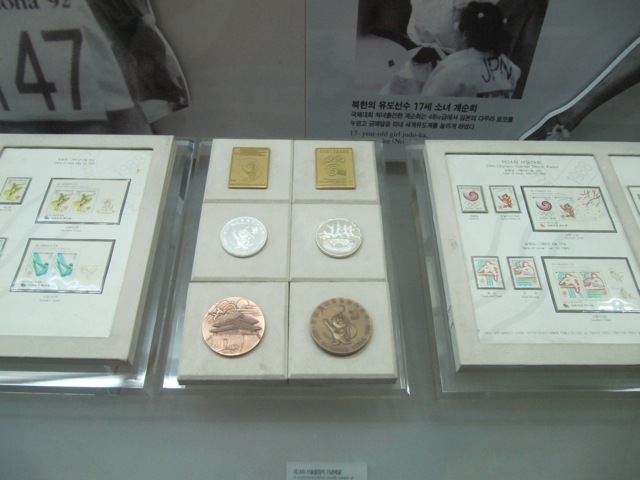 Most were between 13,000 and 16,000 Won. 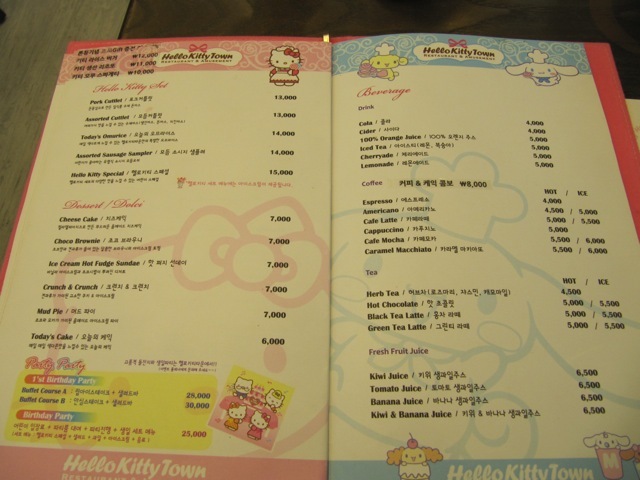 Thankfully, the menu was available in English. Beer and wine are also served if one is so inclined. We ordered the Twisted Mac & Cheese for 15,000W. It was more like cream pasta. It was very good and was large enough to share. 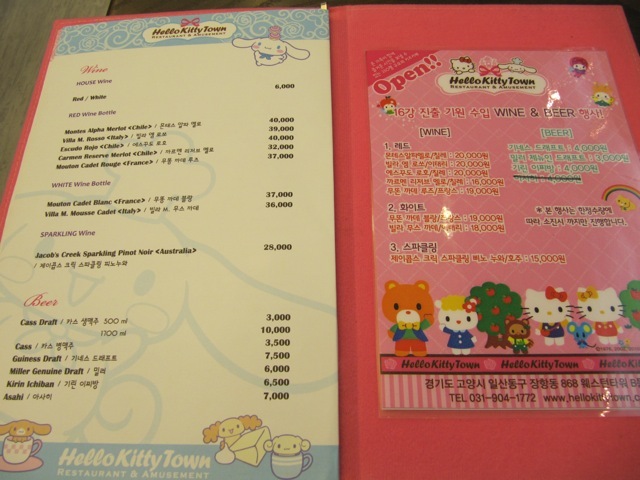 We got the Pork Cutlet Hello Kitty Set for 13,000W. 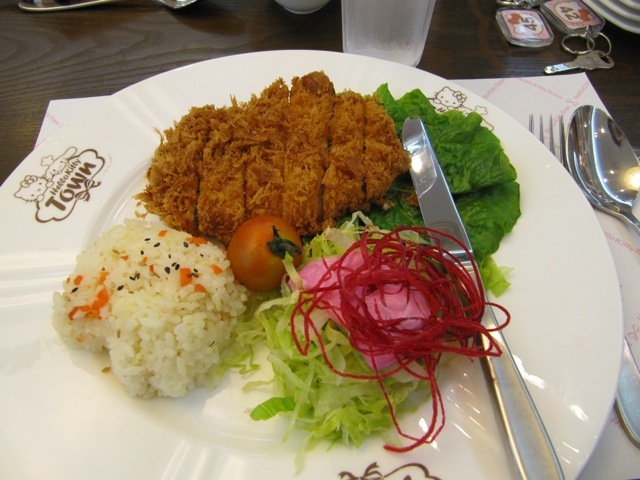 The rice was pressed in the shape of Hello Kitty’s head and the salad had pink dressing. It was a great and delicious meal. 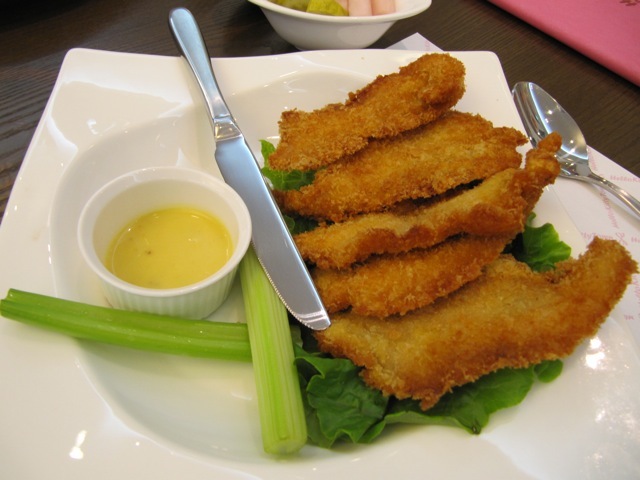 My kids’ favorite dish was the Crispy Chicken Tenderloin listed in the Appetizer and Side Dish section for 13,000W. I would have called that a full entree. It came with Honey Mustard and was plenty to share between two children. It was very tasty. 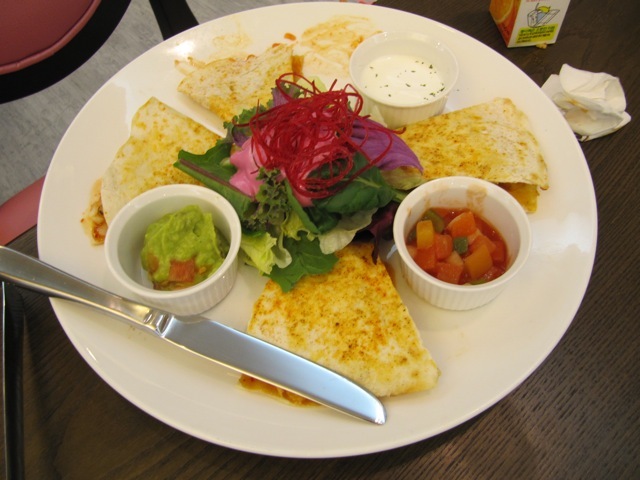 The last thing we ordered was the Chicken Quesadilla, also in the Appetizer section, for 16,000W. This was not something that went over well with the kids. The quesadilla was spicy hot and had pineapples inside along with the chicken and cheese — not a taste we’re accustomed to. I wouldn’t order this again. After we ordered our food, it was play time while we waited. When we finally went room-to-room, I was amazed at how fun it was. This place was delightful! 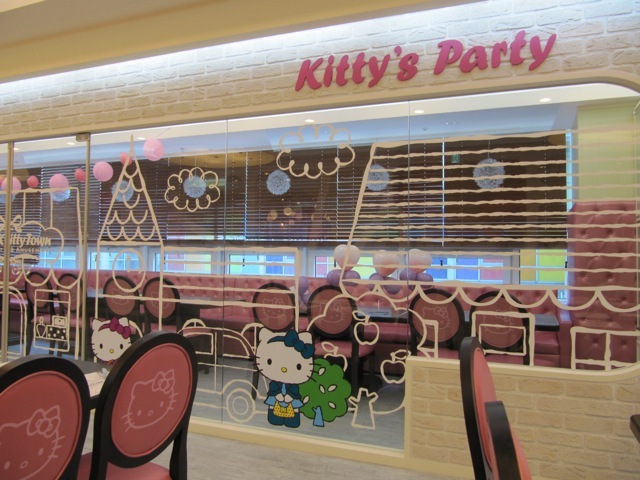 Everything inside was decorated with the Hello Kitty theme. 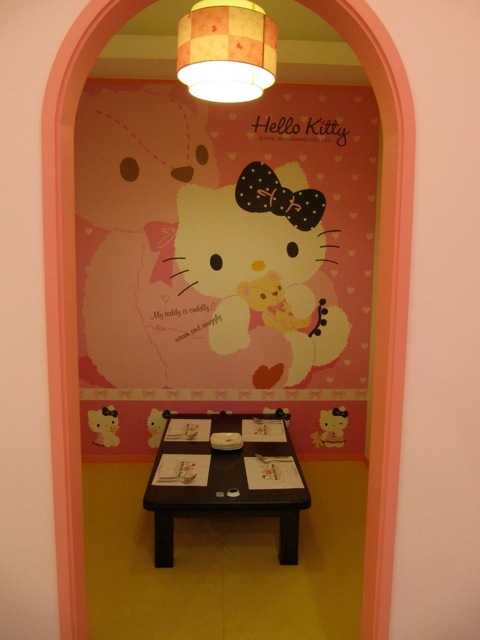 Even the bathrooms had tiny Hello Kitty toilets for kids. 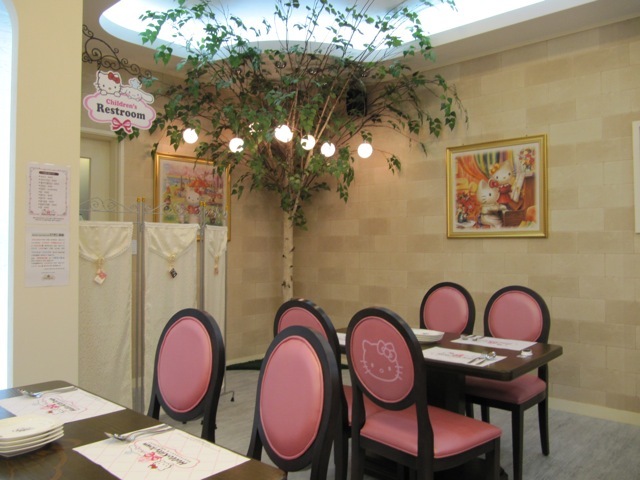 Pink chairs, fancy menus and even private rooms for eating if you desire. 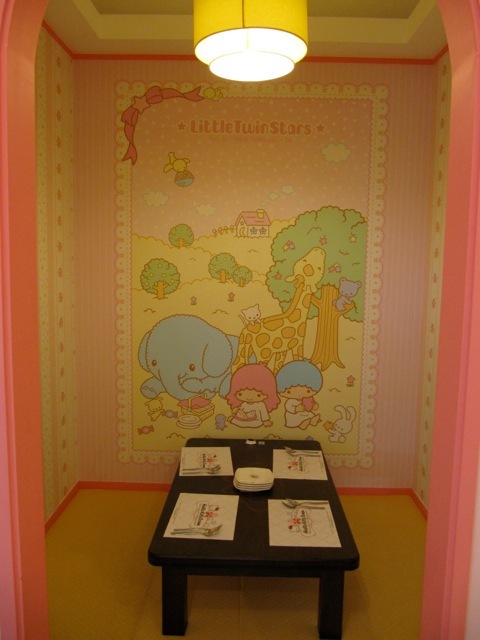 In the private rooms, each has its own Sanrio theme. 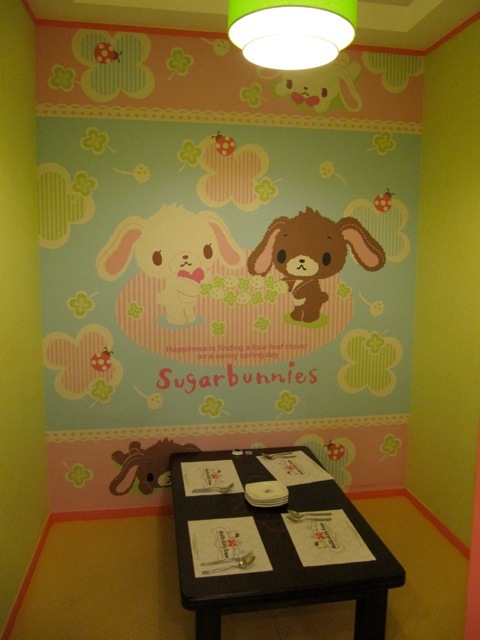 There were Sugarbunnies, Pompompurin, Charmy Kitty, Little Twin Stars and Shinkansen (Bullet Train.) In the Shinkansen room, one father was passed out asleep. So funny! 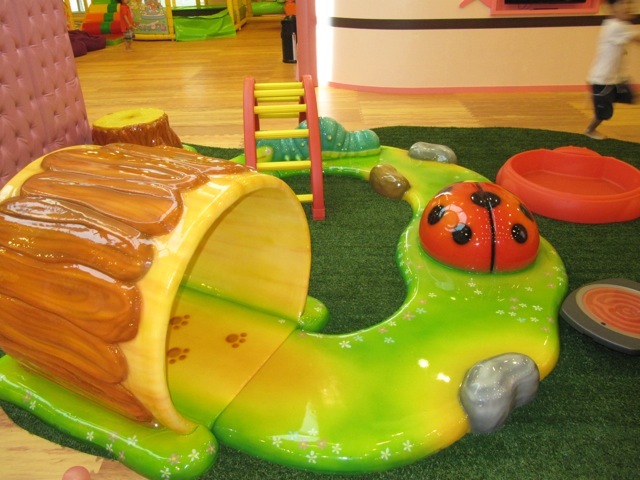 The play space was super fun. 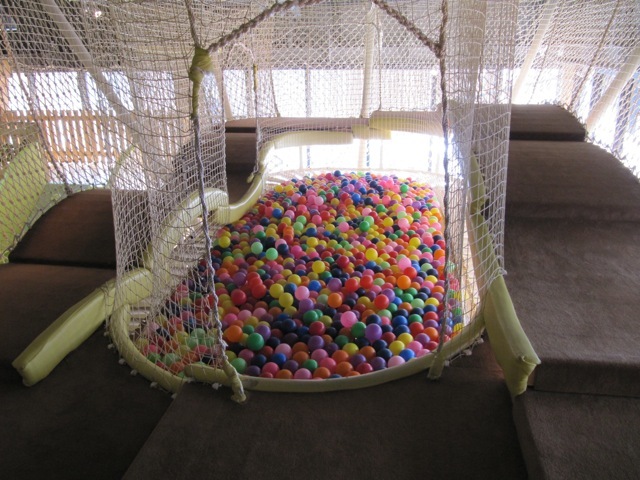 A giant ball pit in the middle of one dining room lets little ones play while parents eat. 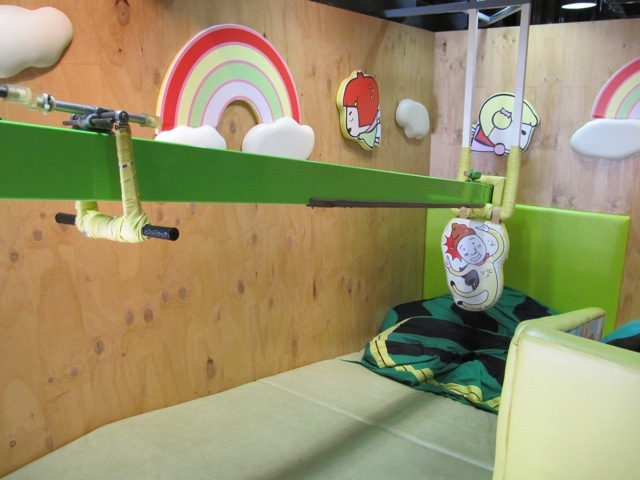 Tiny riding toys and stationary bouncers were available for babies and toddlers. 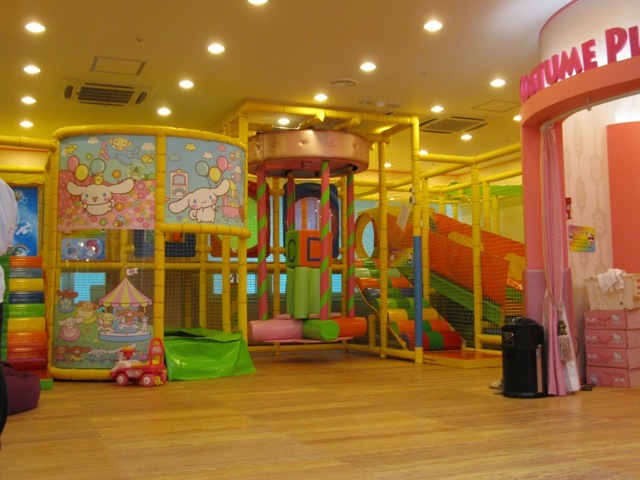 In a separate wing of the restaurant, the massive play area unfolds. 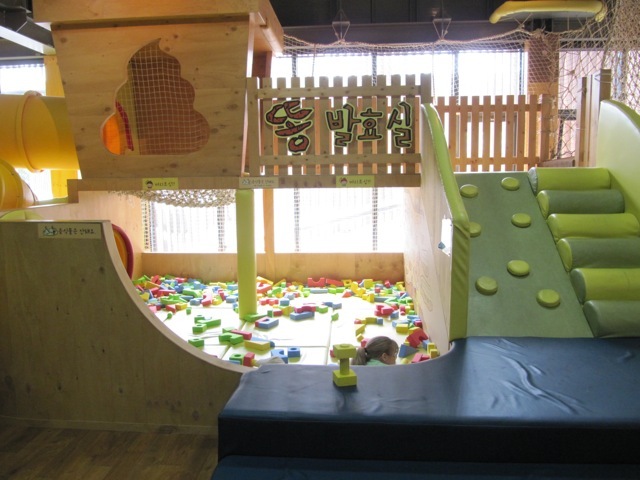 In the climbing area kids can play on a zip line, a rolling slide, a soft merry-go-round, and a ball pit area. There is also a working train which runs every half hour. 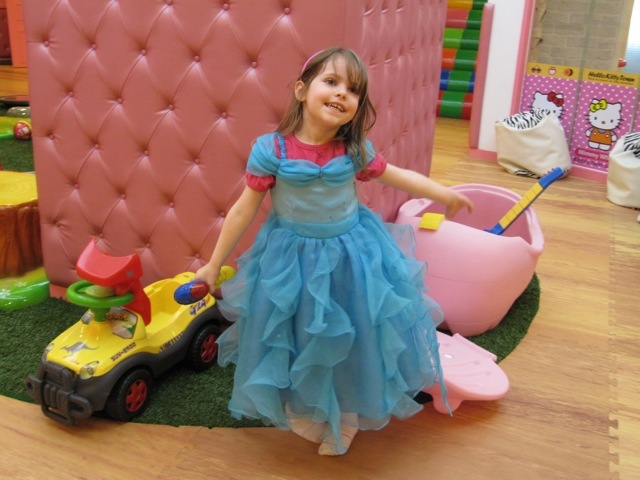 In the costume play zone girls can pick out a dress and wear it during their visit. 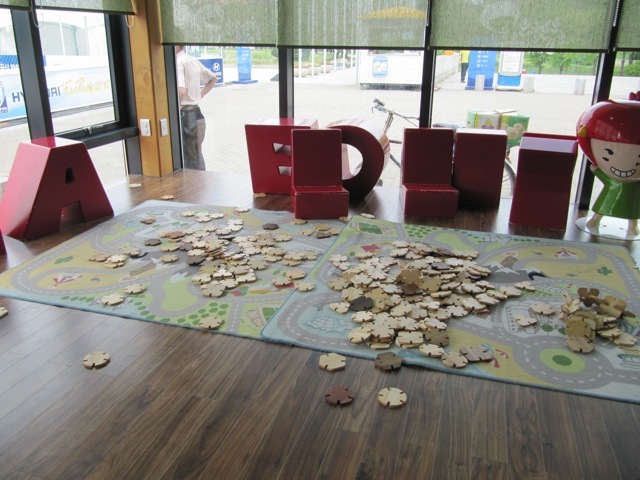 Several people are on staff in the play area to assist and monitor children. A few of the girls enjoyed helping Kiki get dressed up in several outfits. 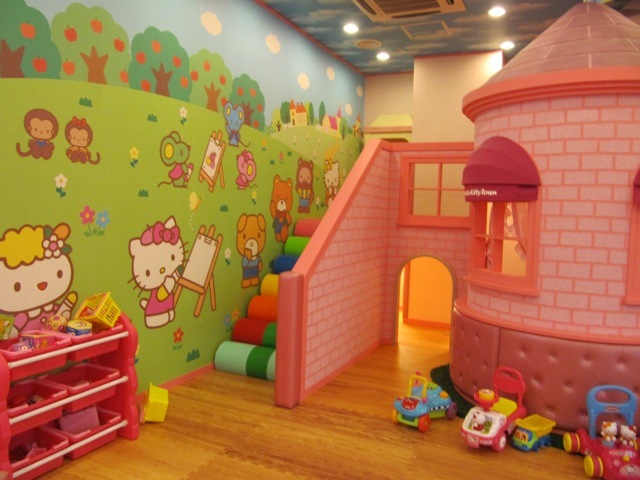 Inside Hello Kitty’s big pink house, kids can crawl through small spaces, play with kitchen toys and play house. 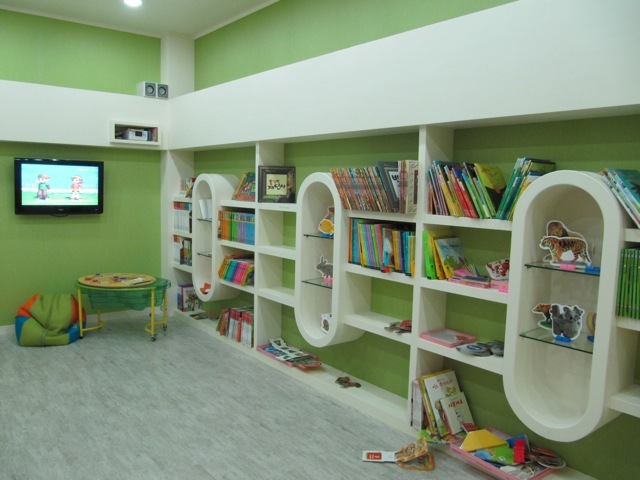 Inside Kitty’s Library, children can play board games, read books and watch educational videos. The ones playing while we were there were in English. A television and camera system allow you to watch your child from your dining room or private room on viewing screens placed around the facility. 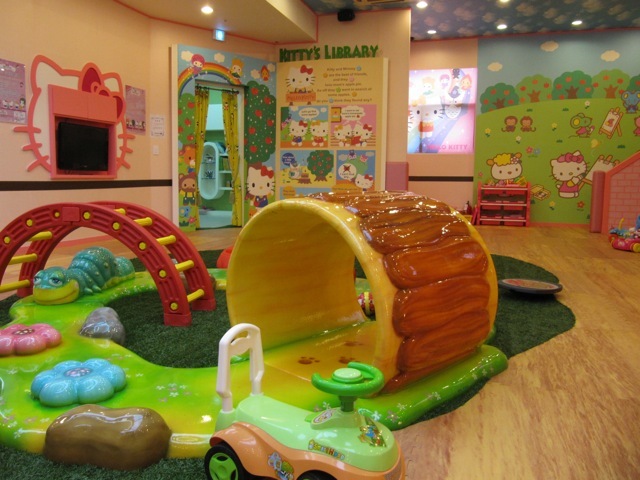 For parents looking for a fun place to hold a birthday party for kids in Korea, Kitty’s Party room is all set up and ready to go. 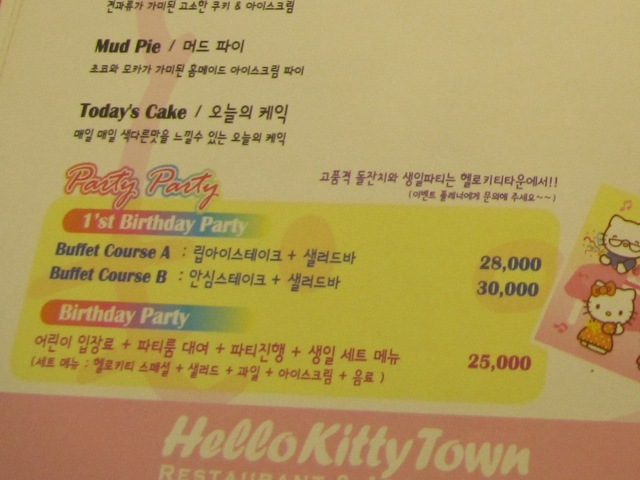 They even have special party packages for the all-important Korean 1st Birthday. 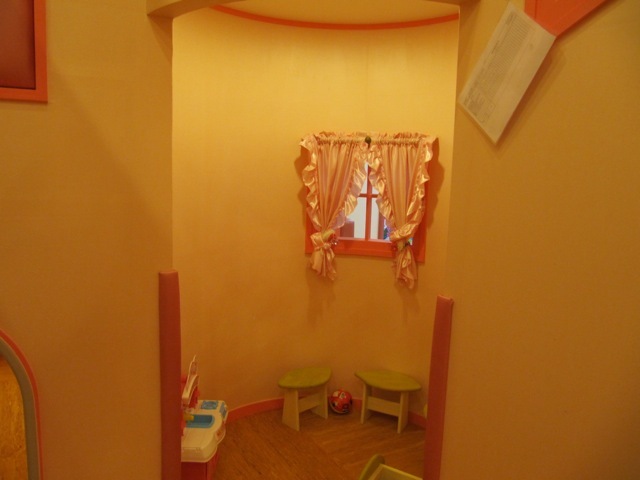 There is also a nursing room for moms with babies and a place to let sleeping babies rest. 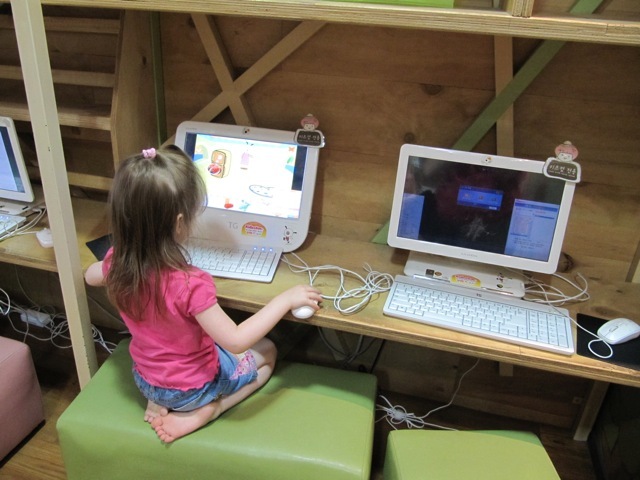 A computer station is even available for moms to use while kids play. 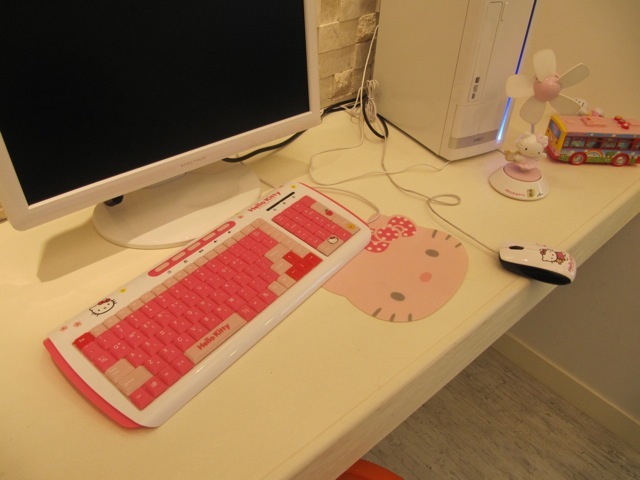 We loved the Hello Kitty computer keyboard, mouse pad and mouse! 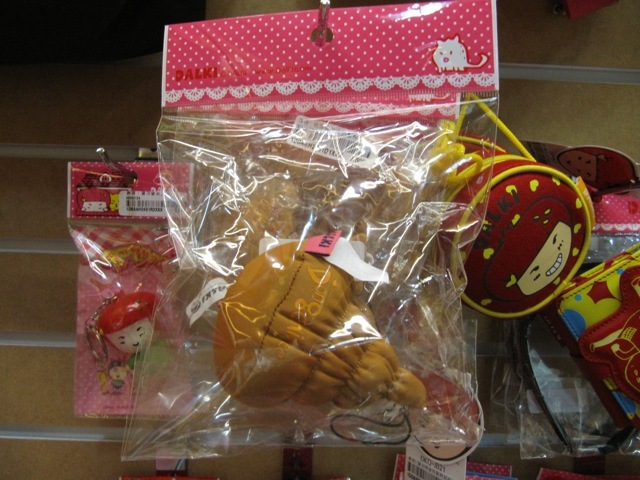 The Sanrio Gift Shop was small but had some cute things we didn’t want to leave behind. We bought some Japanese towels and Japanese plastic bowls. 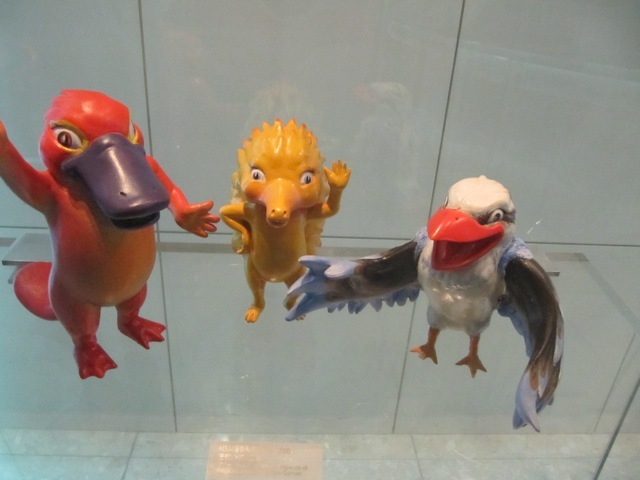 These were the actual kind for sale in Japan and I was happy to find them here. The Japanese kids’ towels are so adorable and are very sturdy. 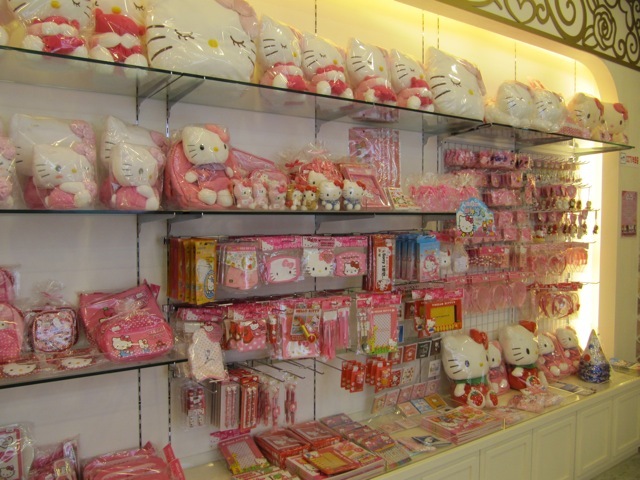 I haven’t seen them for sale in other stores here in Korea so it was exciting to find them at this little Sanrio shop. The plastic rice bowls are also something I’ve only seen in Japan until now. 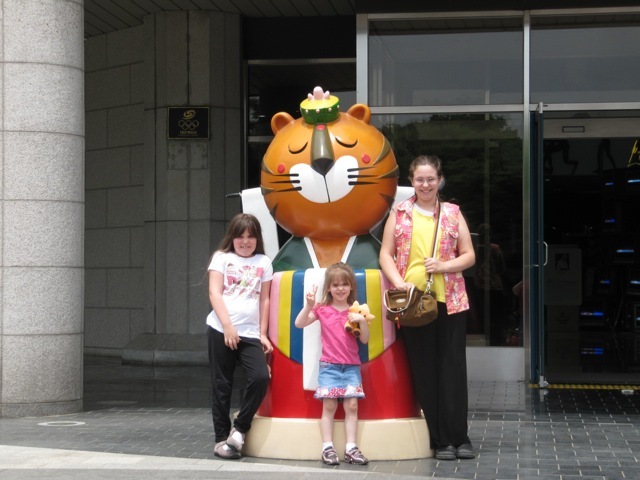 It made me miss Japan all over again. 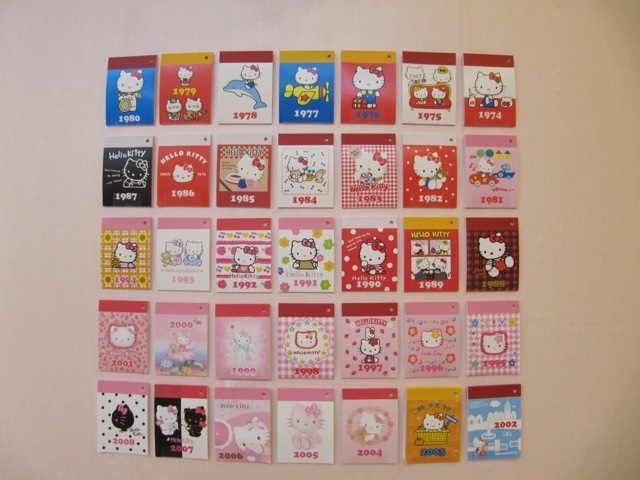 With our purchase from the gift shop, the cashier gave us several of these little Hello Kitty booklets from each year of Hello Kitty art. This display was on the wall so we didn’t get every year, but they gave us about five little booklets. So, what do you think? 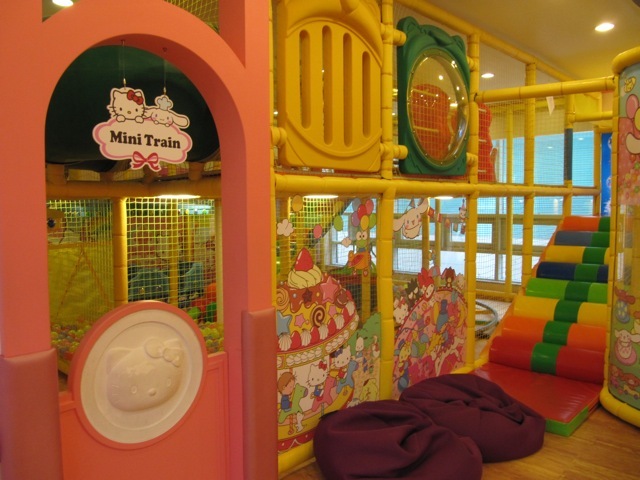 Would your kids enjoy a visit to Hello Kitty Town? Additional purchase of food or beverage optional. Take the Orange Line, Line 3, to Madu Station. 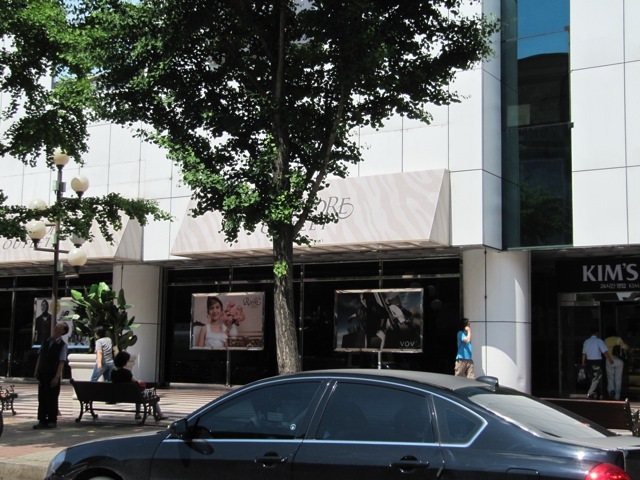 Walk one block towards the New Core Outlet Intersection, past Kim’s Club store. 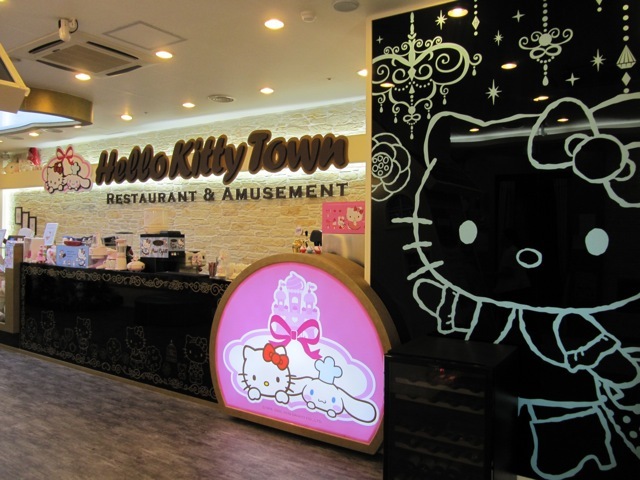 Go left one block and see the Hello Kitty Town Restaurant and Western Dom Mall on your right. 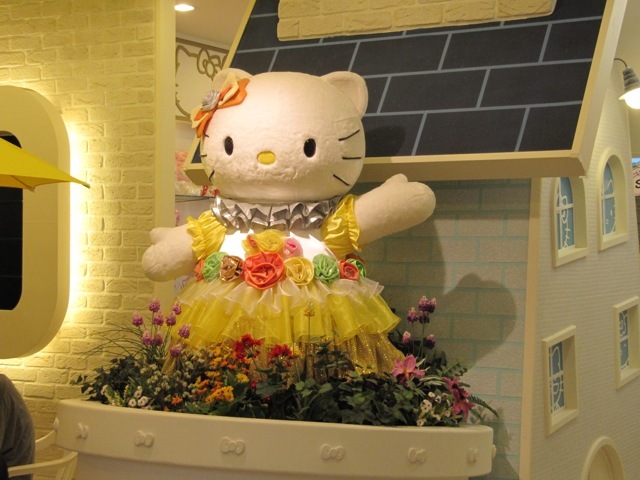 For more Hello Kitty fun, plan a trip to Japan’s Kyushu Island and visit Harmony Land, a Hello Kitty Amusement Park. 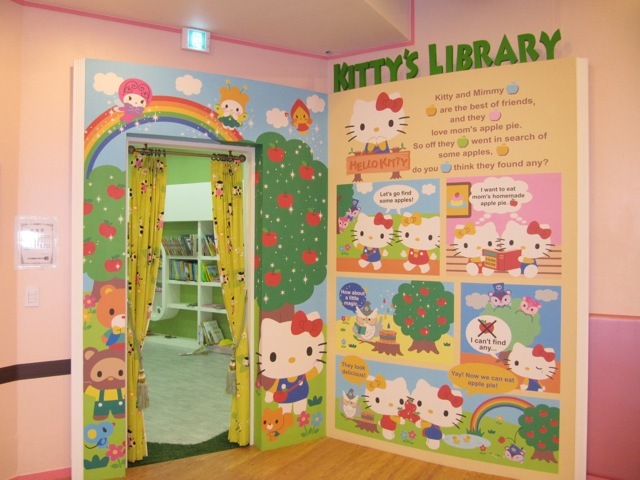 You can also take a trip to the Tokyo area and visit Sanrio Puroland, an indoor theme park for Hello Kitty and her friends. It’s really fun! At some point, I’ll get around to posting about that experience, too! 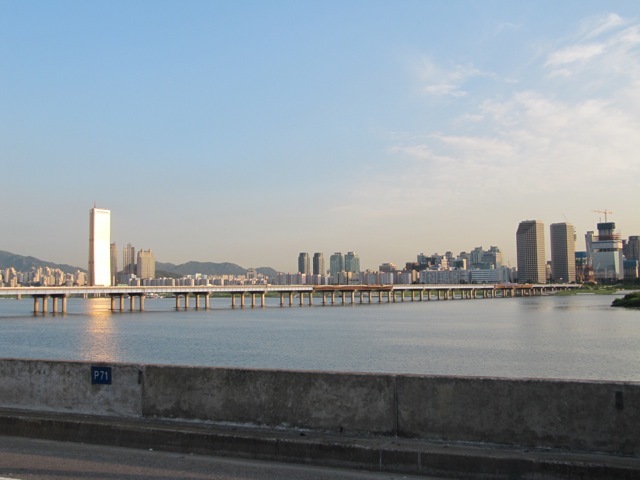 We had the most lovely sunset drive along the Han River this week. 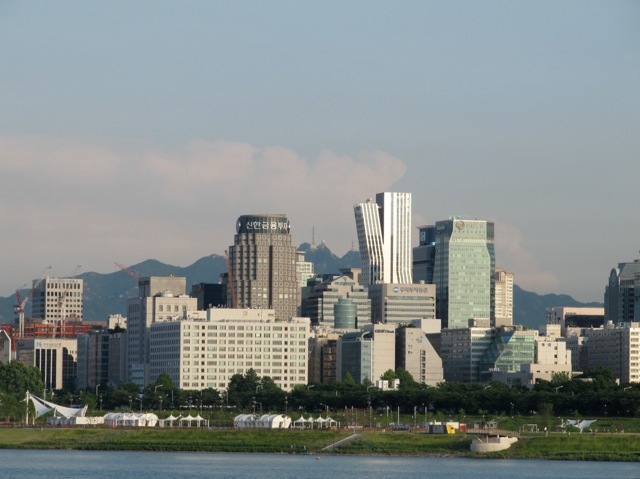 It was a rare day of clear skies and a few puffy white clouds here in Seoul. Not like the hazy, foggy, yellow sand days we so often get where the only visible color in the sky is grey. No, on this day, the hills on the other side of the river were in full view and the sunset cast a beautiful glow on the bridges and buildings that line the highway. 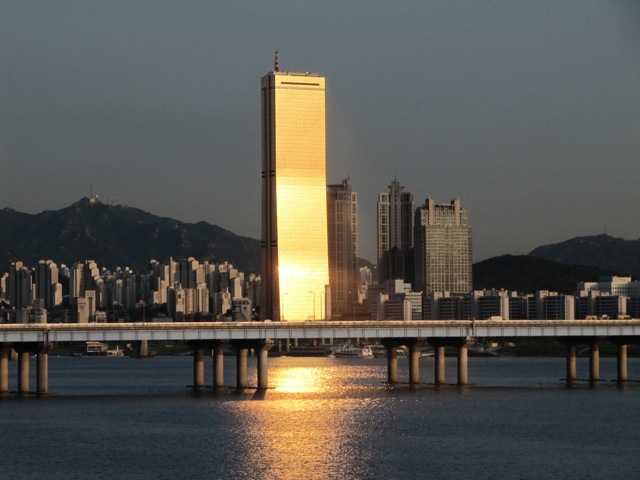 Even more remarkable was the glow of sunlight that was reflected off the golden windows of the 63 Building, called the Yuk-Sam Building by locals. 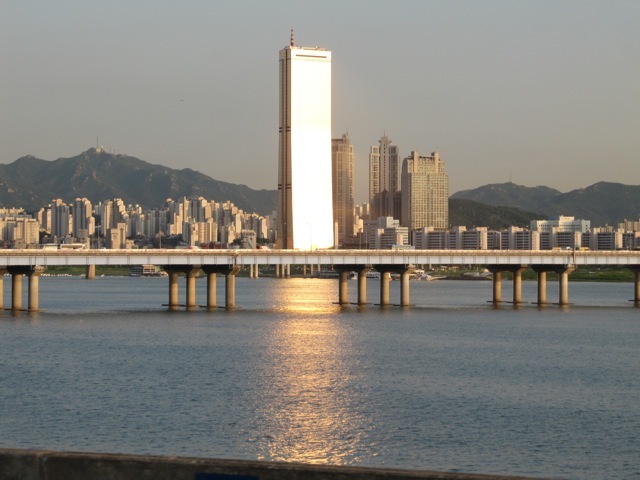 It shone like it was entirely made of light and the reflection on the river was just as brilliant. The heavy traffic on the way back into the city at sunset meant that there were plenty of opportunities to take photos as we sat still waiting for traffic to move again. We weren’t the only ones taking photos. Many Korean people were also snapping shots with their cell phone. 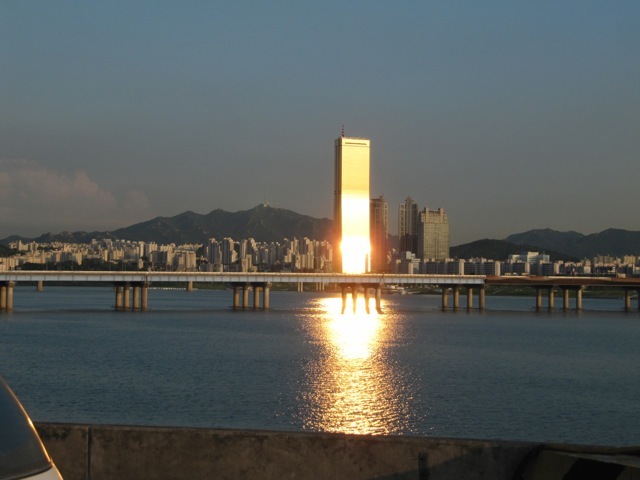 I’m sure photos are showing up on Korean blogs around the city. 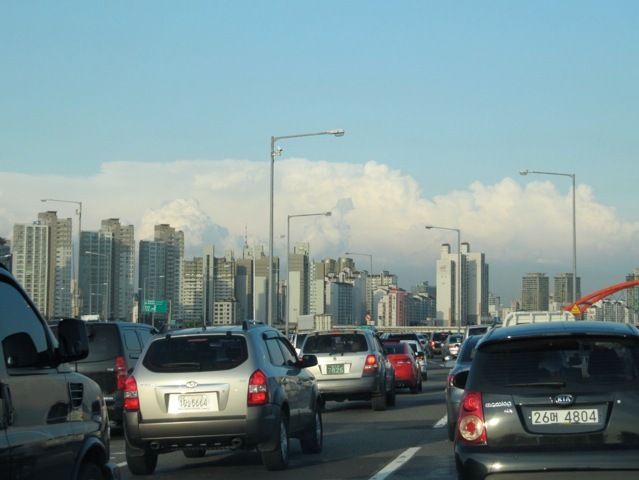 Driving back into Seoul at rush hour is never a good idea! Thankfully, the scenery on this day was a beautiful distraction. We could actually see blue skies and puffy clouds. Oh, how I miss that simple pleasure! 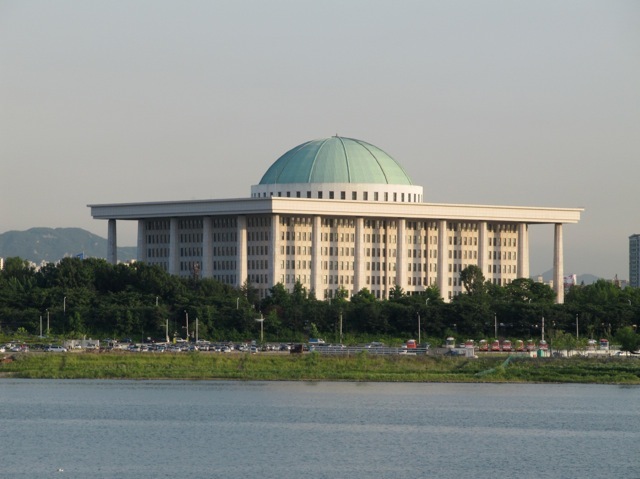 This is the National Assembly building in Yeouido. 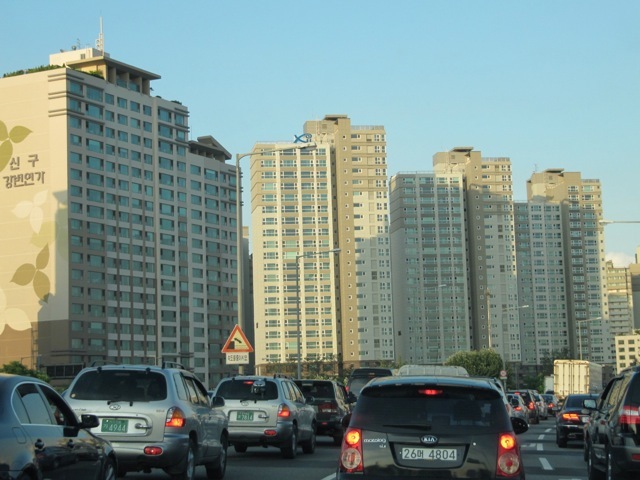 These tall apartment buildings line the expressway. Two to four families live in multi-room apartments on each level. 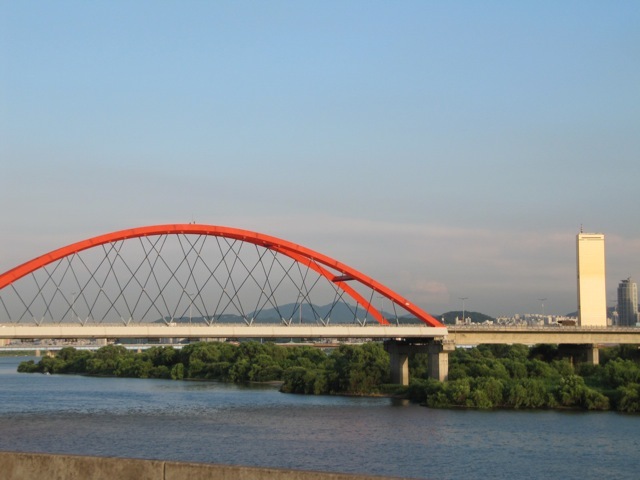 I think this is the Mapo Bridge. 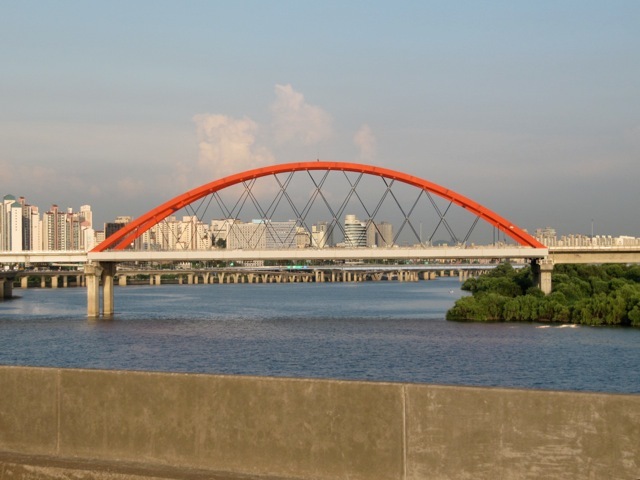 I think this concrete bridge is the Wonhyo Bridge. 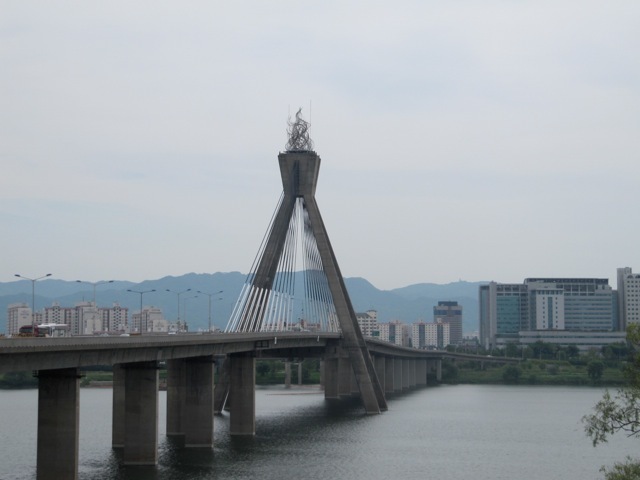 I believe this is the Hangang Railroad Bridge. I am just another Jenny writing jenonymously about my kaleidoscopic life. Published writer, SCBWI advisor, mother, friend, collaborator, traveler, lifelong learner, student of Asian culture and Japanese language. I Drive Like a What? I Love Egg. Do You?